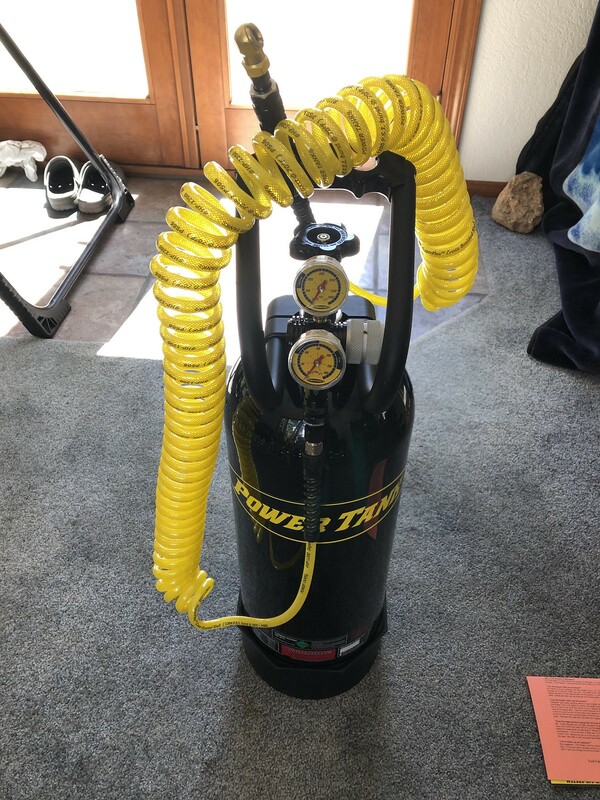 Went to Power Tanks and purchased their 20 lb Co2 tank, with tank boot, 250 psi regulator, and 30 ft coiled hose to fulfill my tire refilling needs while on the trail. Sucker was expensive (~$700) but ARB air compressors aren't super cheap either. I heard one too many bad reviews of the ARB OBA and decided to pick up a system that has fewer moving parts, and more importantly, one that can easily be stored in my relatively temperature controlled garage when it is not being used, as opposed to always being under the hood, heating up and cooling down every time I drive. Plus, ~30 seconds to fill one of my current (stock) tires from trail pressure to road pressure is hard to beat. It certainly outpaces even a dual ARB compressor. Went to RotoPax and ordered a 3.5 gallon FuelPax container, which conveniently enough came with a ~$30 mount for my bedrack. Up next are recovery boards (probably MaxTrax, unless someone recommends something else) and a dynamic recovery strap (not sure on a brand, if you have experiences with any please let me know). After that I will be done acquiring parts for a while, and I'll focus on using the truck on excursions since spring has rolled around. Went and dropped off the Relentless Modular Bed Rack to the only powdercoater in my small town. They mentioned a 4 day turnaround for ~$150. 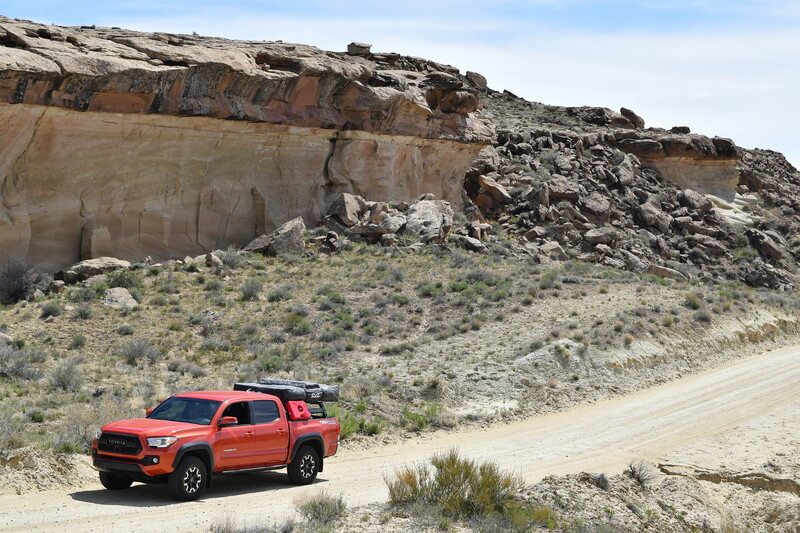 First trip of the year is shaping up, so looking forward to getting the truck prepped for the adventure. The time finally arrived. 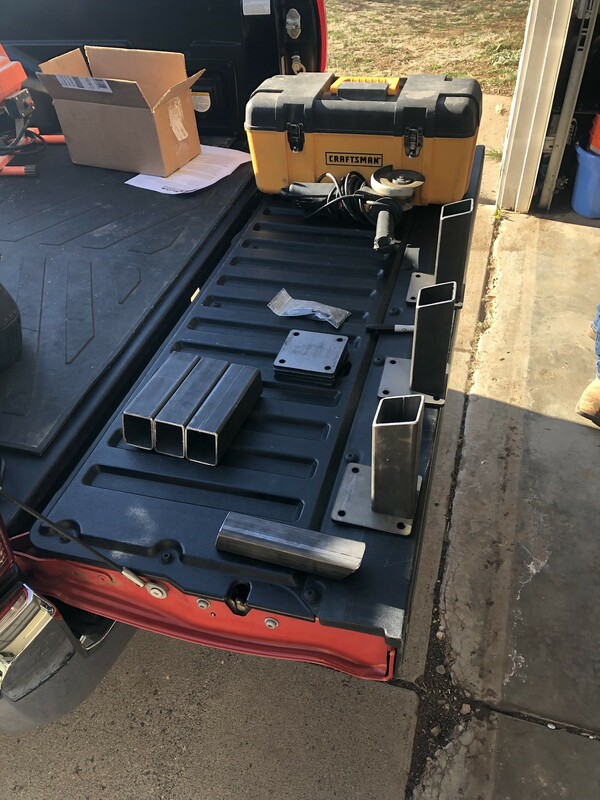 My 4X Innovation sliders needed to find their permanent home on the frame of my truck. Arrived at my buddy Matt's house at 7 am to get to work. He had the welder and associated necessities, and I brought the grinder, jack stands, tools, etc. We figured out the game plan and laid out all of the components. Each piece received some love from the grinder to prep the welding areas. We test fit the sliders to the frame, supporting them with jack stands per the manufacturers recommendations. Plate locations on the frame were marked so the frame could be stripped of its paint coating prior to welding. 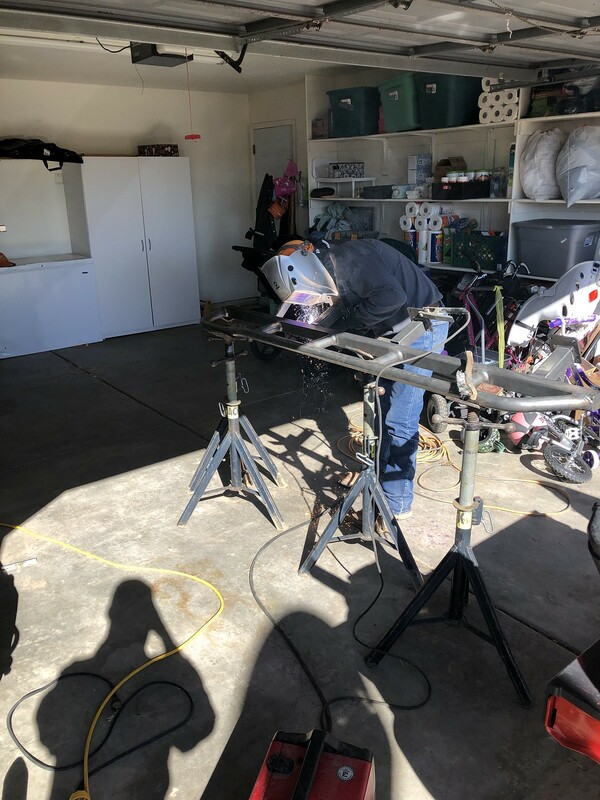 Matt affixing the legs and plate and gussets to the sliders. After the slider was assembled in the garage we brought it back out to the truck. We fine tuned the placement, maintaining level front to rear, body gap, and angle. We quadruple checked the fitment from every angle we could manage and then the moment of truth arrived. It was time to stick these things to the truck permanently. A slightly tense moment, if I am to be completely honest. But Matt has tremendous real world skill, so he did a fantastic job on the install. 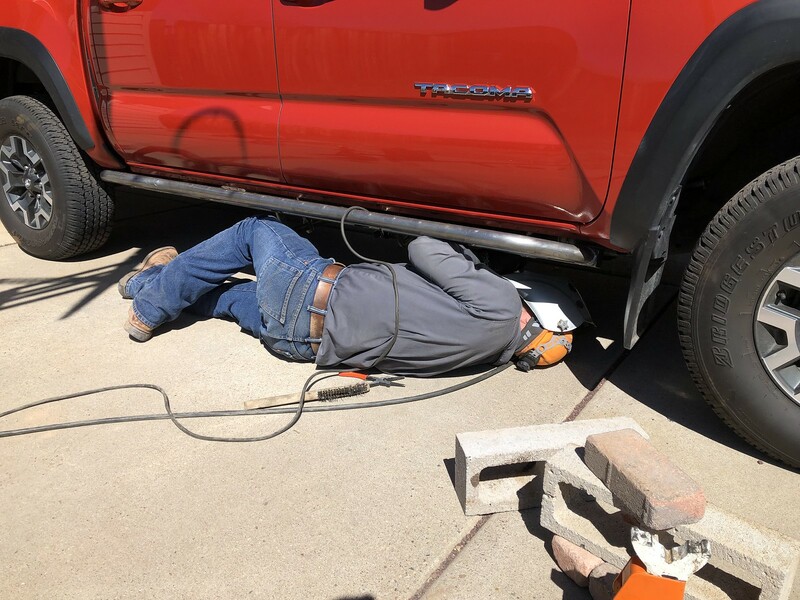 All in all, for both sides, it took 7 hours of work to complete the welding portion of the install. We didn't take any breaks and we were splitting tasks and working diligently the entire time. Definitely longer than I anticipated, but the quality of the work was the top priority, so that drove the schedule. The next day I set out to get the sliders prepped and painted. 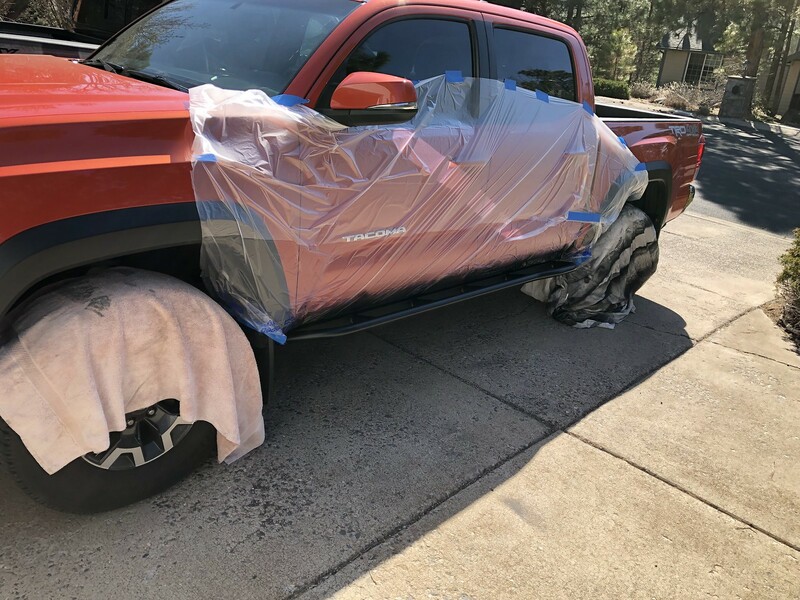 The first step was to mask off the side of the truck. Some painters plastic and a second set of hands made this step easy. The next task was to do a final cleaning of the weld area. A metal file helped with this task. Next was a quick scuff with some sandpaper. I finished off with a thorough wipe down with Acetone. The paint laid down quickly and easily. I was careful not to miss any areas, as I do not want premature rusting of any of the steel components. Three coats later and they are finished! They look fantastic and are stout as hell. While I hope I never need them, I am glad that they are there to protect that ever so vital part of almost any vehicle. I will be doing periodic inspections of the slider and frame to make sure everything is as it should be. Now it's on to the next thing! Just had my 20 lb Power Tank filled. Excited to test it out in two weekends! After knocking out all of the work that I needed to get done for the week on Monday through Thursday, my first trip of 2019 was set to begin early in the morning on the 12th of April. The destinations were three-fold. 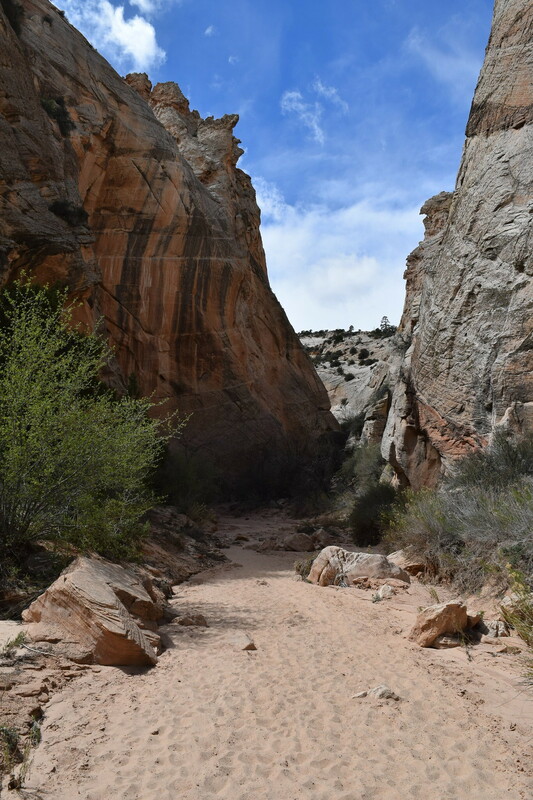 The first would be the beautiful Cottonwood Canyon Road, located just north of the Arizona/Utah border, slightly west of Big Water, UT. 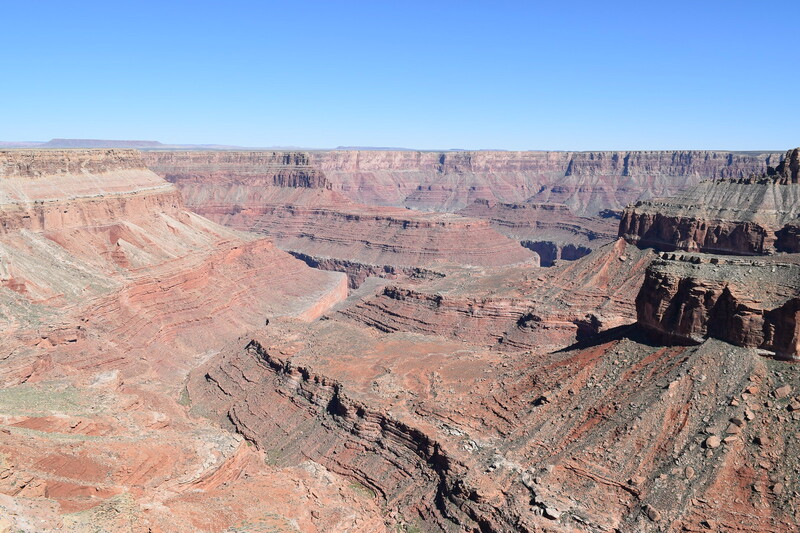 The second would be a quick pit-stop in the small town of Hurricane Utah, with the third destination being my favorite place on earth, the North Rim of the Grand Canyon. Spirits were high, even with the weather looking less than ideal, when we started packing up the remainder of our gear into the truck on Friday morning. My co-pilot is a great friend and mentor, Tony. He’s taken control of route planning and cooking, which left me with the driving and documentation portion of the trip, an excellent arrangement in my book if I had to admit. As this is my first Trip Report on TW, let me introduce the rig that will be transporting us from place to place. 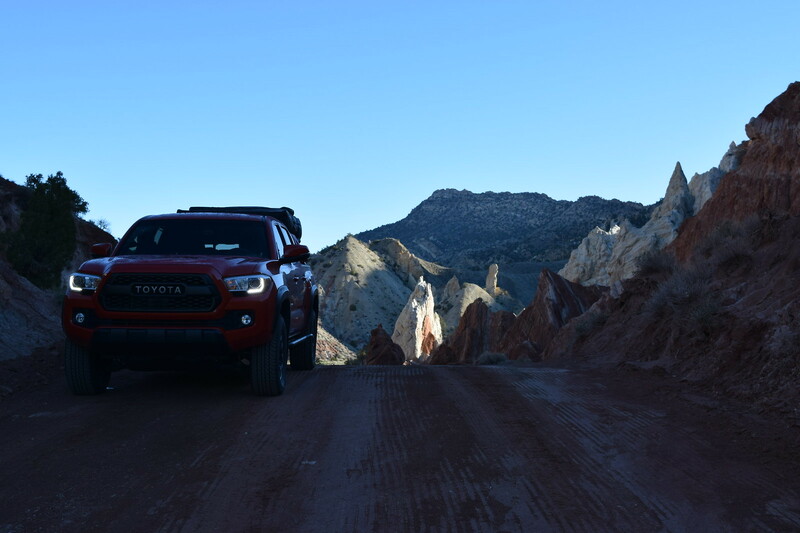 2016 TRD Offroad 4x4 with 4X Innovations Weld-on Rock Sliders, Relentless Fab Modular Bed Rack, CVT Mt. 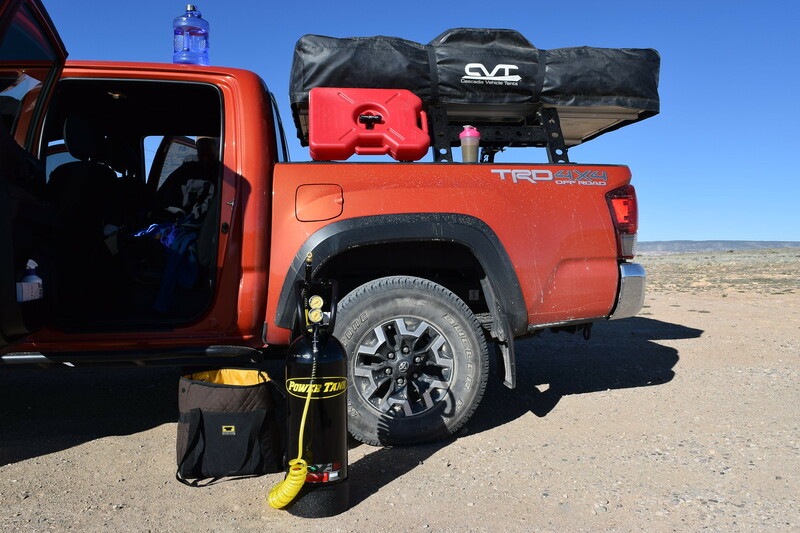 Rainier Extended RTT, 20 lb Power Tank, and plenty of self-recovery gear. Tires, Suspension, and Armor are all OEM. 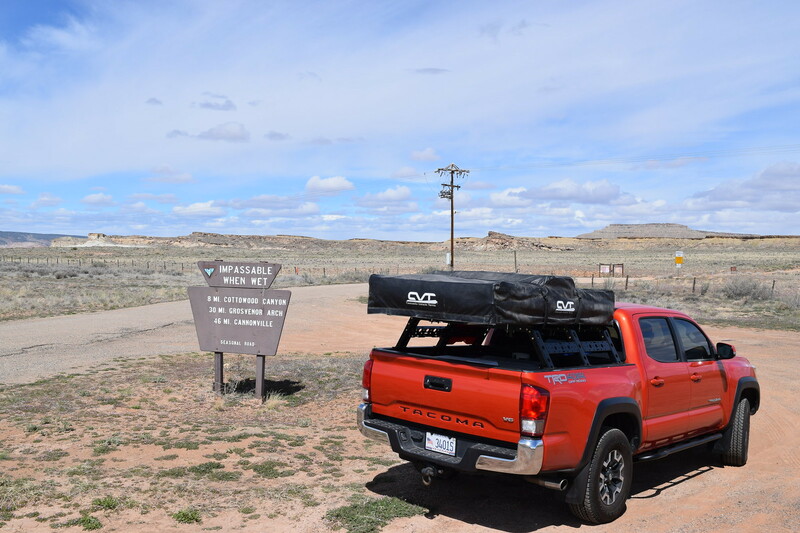 With the truck packed, a quick picture of the rig was needed to solidify the beginning of adventure! At 7:45 AM, we set our sights North/Northeast, heading up the 89 freeway towards Page, AZ. 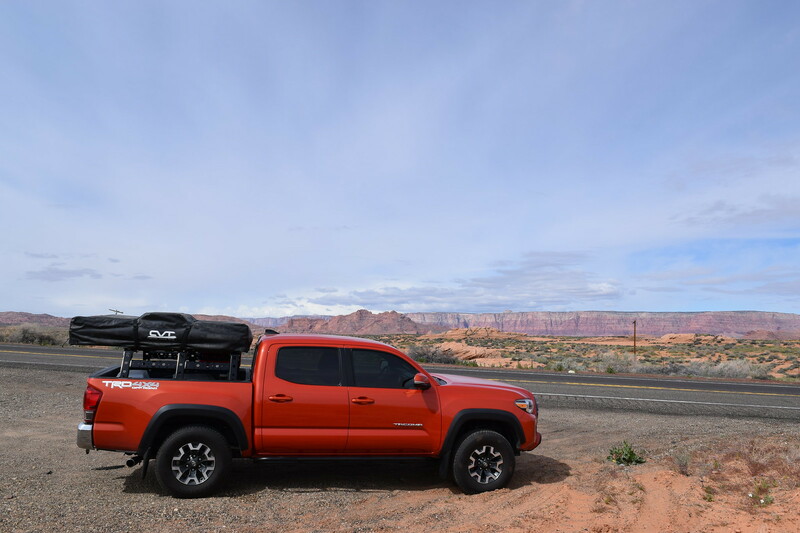 We make great time with the cruise control set to 65 mph through Cameron, past the turn off for Tuba City, and up the windy mountain road that drops gradually down into Page, a small town on the northern border of Arizona. During the drive, the silence was filled with a book from Audible, Lonesome Dove, a great (and very long) story if I have ever heard one. The tale of Augustus and Cal a great companion for the paved highway miles. 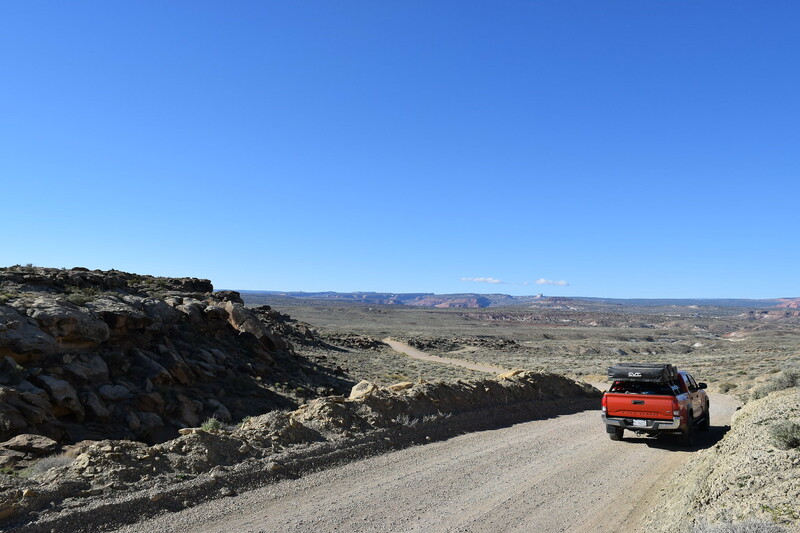 On the way down into Page we make a quick stop off of the side of the road to stretch our legs and take in the views, the mountains and cliff faces an attractive alternative to the white and yellow lines painted on the asphalt. Our first compliment of the trip occurs at this small pullout (which is someone’s long driveway as it turns out). 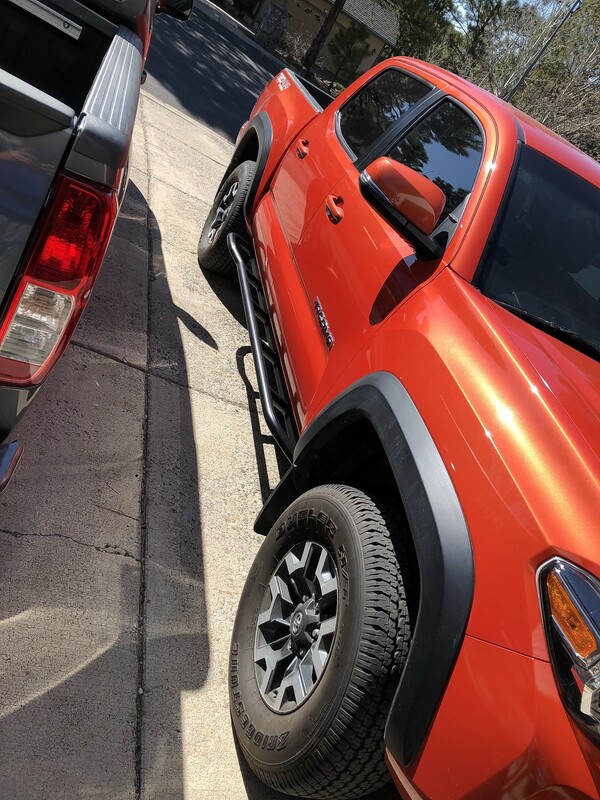 An older Navajo lady in an aged Suburban asks what color the truck is, saying it is very beautiful to her to in the midday sun. Once in Page we make a quick stop for gas, although the tank is still over 3/4 full. 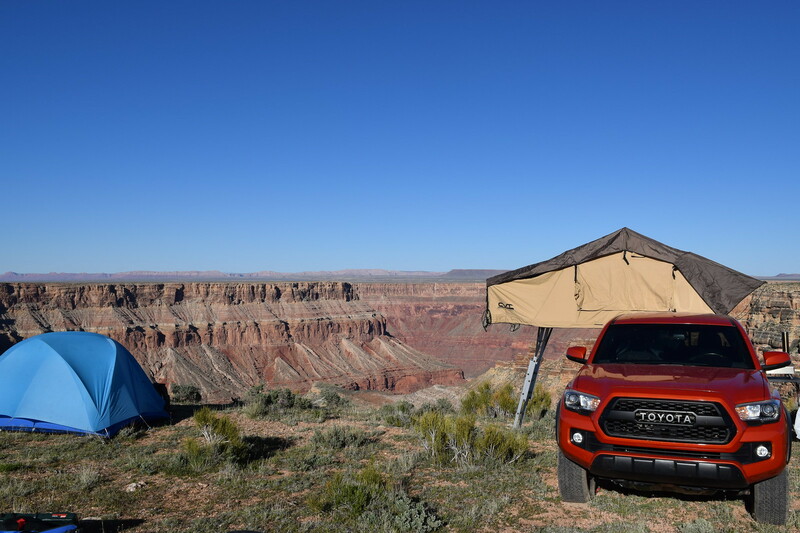 While topping off the truck, a second visitor approaches, asking me about the truck, and the tent that sits atop the rack, as his son is on the fence about making the switch from cars to trucks. We chat for a couple of minutes and bid each other goodbye. I always love how vehicles can bring strangers together under a common topic, sharing advice and stories with each other that would otherwise be lost. 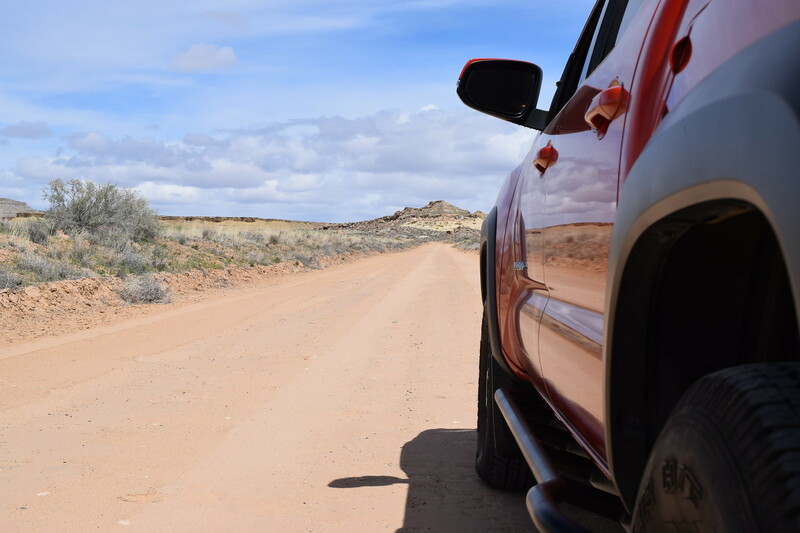 With the tank back above the full mark, we set off at a leisurely pace through the outskirts of the small town near Lake Powell. 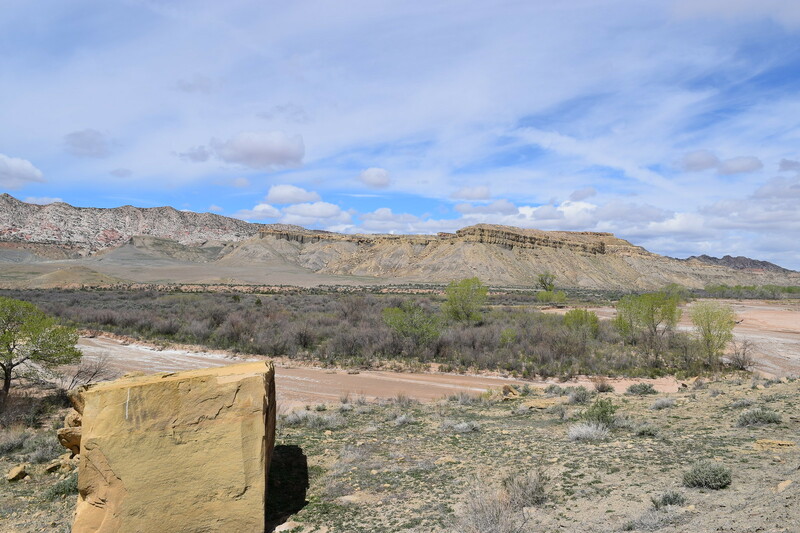 Within a few minutes we drive past the dam that formed Lake Powell into what it is today. 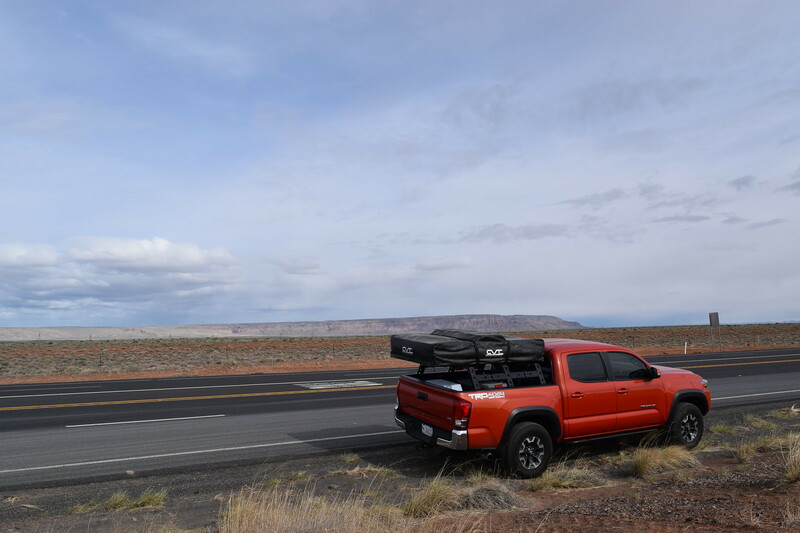 Pushing onwards, we approach the border of Arizona and Utah. Lonesome Dove has been paused temporarily while the map is studied. As we reach the ‘Welcome to Utah’ sign the trucks radio blurts out ‘Welcome to Utah’ which I thought was a pretty neat trick. 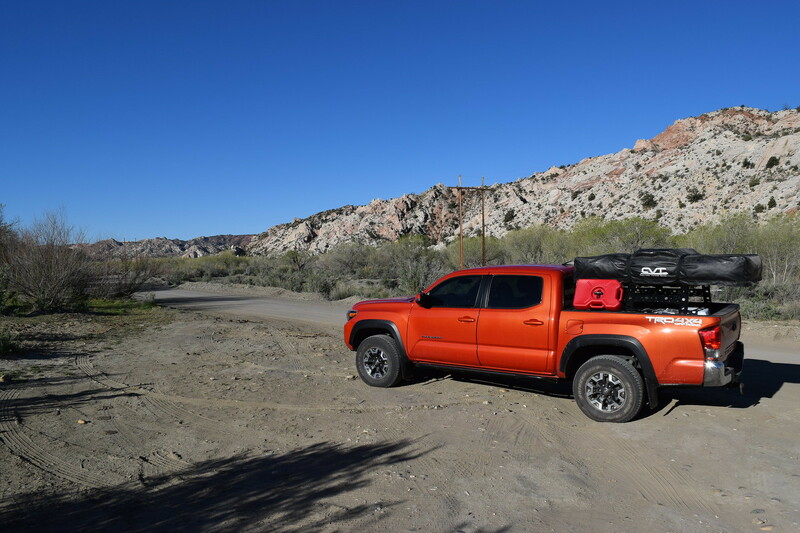 We cruise through Big Water UT, still on the 89 freeway, which is a tiny place, and soon spot our turn off away from the paved roads and traffic we have traveled thus far. 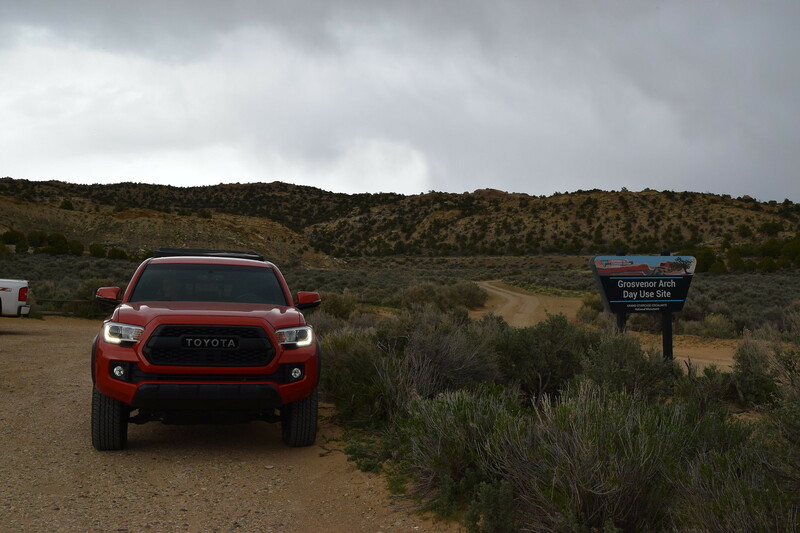 We had made it to the origin (or termination, depending on your direction) of Cottonwood Canyon Road. 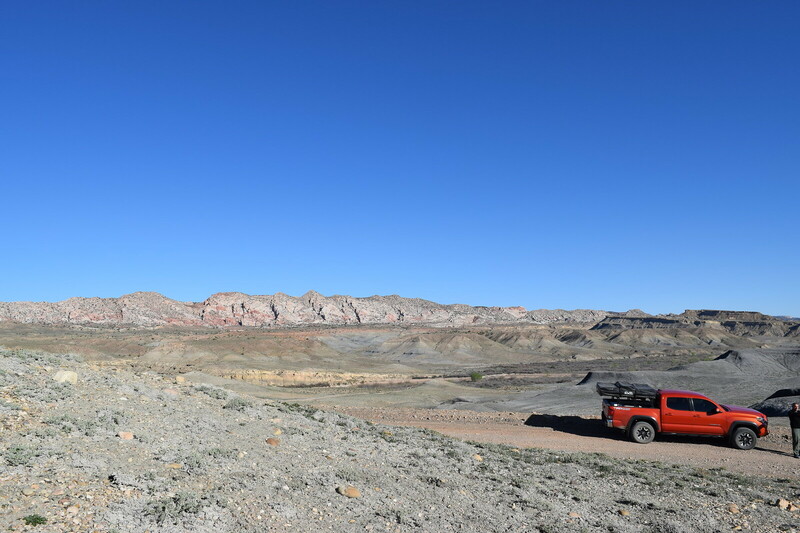 The 46-mile long road was originally constructed to service the power lines that run from the 89 freeway up to Cannonville, Utah. The power lines presence a constant reminder that sometimes-easy access to adventure is a by-product of man’s encroachment into nature. 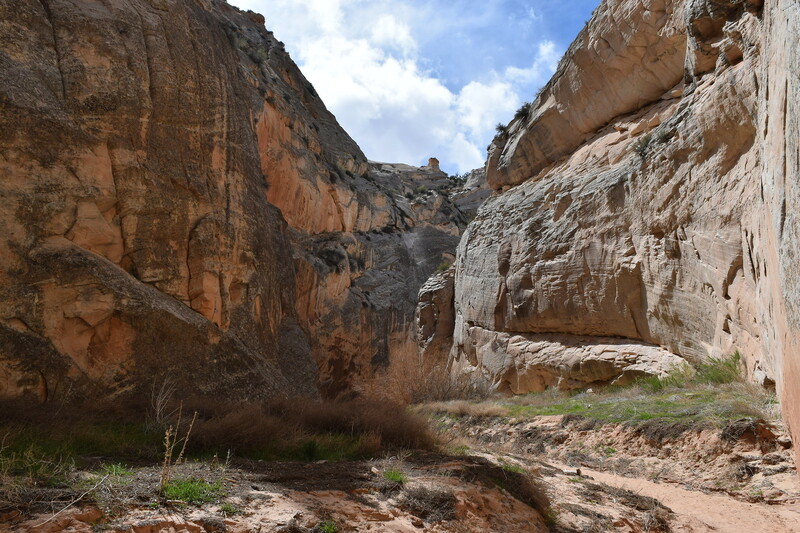 The sign promptly states, “Impassable When Wet”, a clear indication that a keen eye needs to be paid to the weather, though the forecast presents no information about heavy rain in the near future. For now, the road is bone dry. 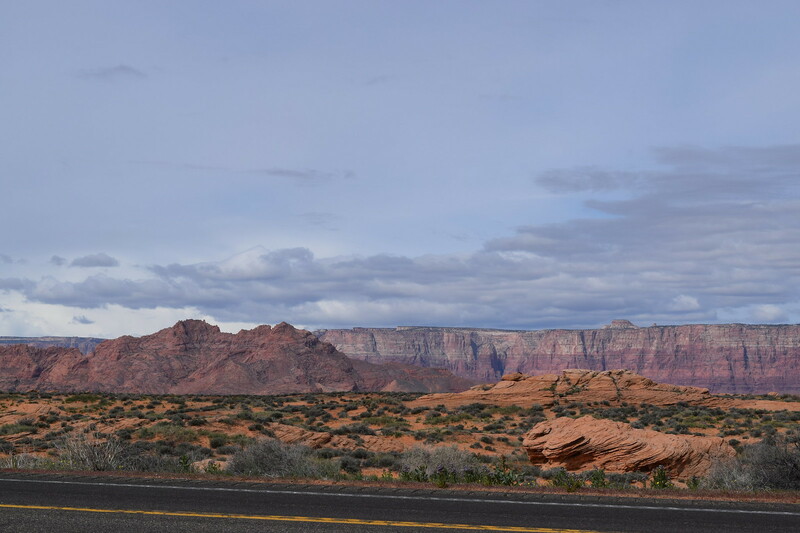 The terrain, from the entrance parking lot, appears to be very similar to what we saw from the freeway, but we knew that epic views were abundant just around a few bends. So, we aired the tires down to 20 psi and set off! Within minutes the views began pouring in, almost too many to count, each with its own uniqueness. 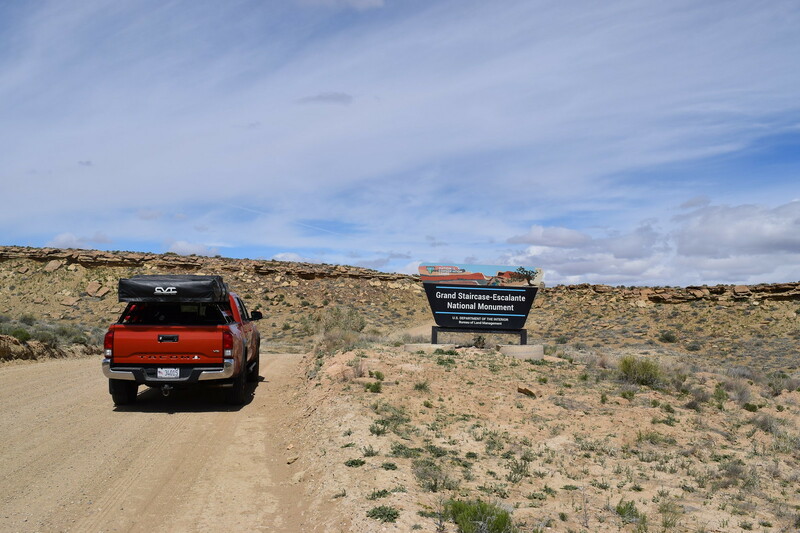 After a few miles we hit the sign representing the entrance to the Grand Staircase-Escalante. 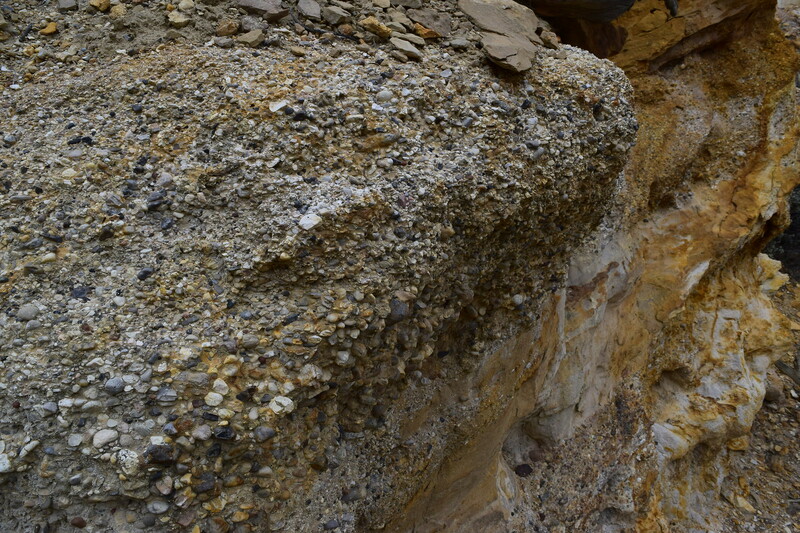 We noticed interesting ground formations while traveling along. 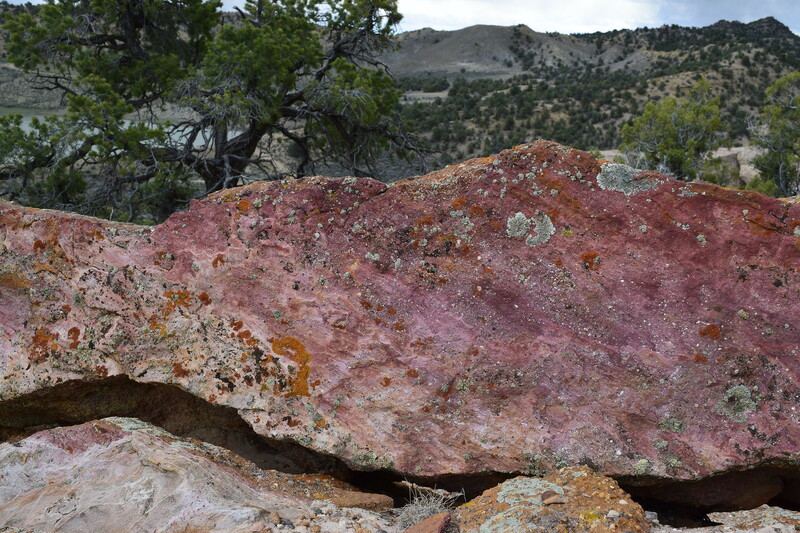 Apparently, they are created by underground clay expanding when they become wet, forming the mounds that sit before us. Neat! The views just kept coming in. The vast expanse, mated with the mountain range in the background, was pleasing to they eye. Too often I spend most of my days looking just a few feet in front of my face. Having the ability to really open up my eyes and take in a variety of distant information provided a strange relaxation that I miss on the day-to-day. This single aspect is what drives my sense of adventure. 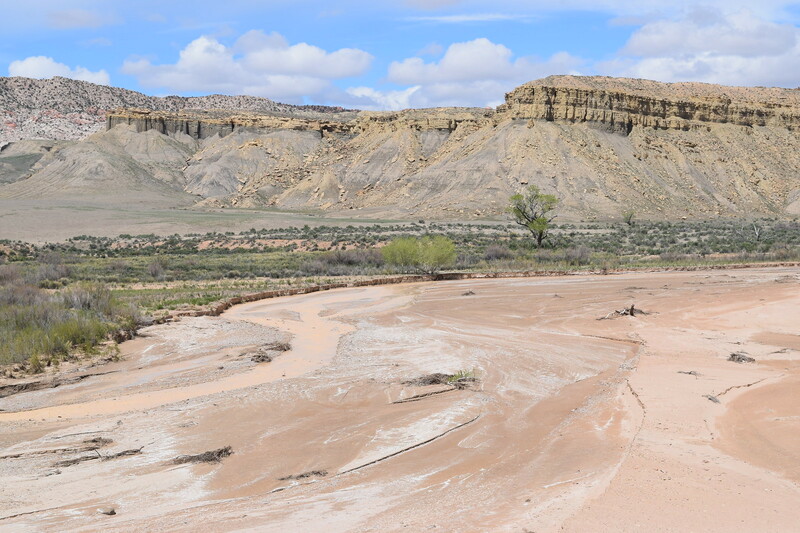 The Paria River follows Cottonwood Canyon Road for a small section of the road. 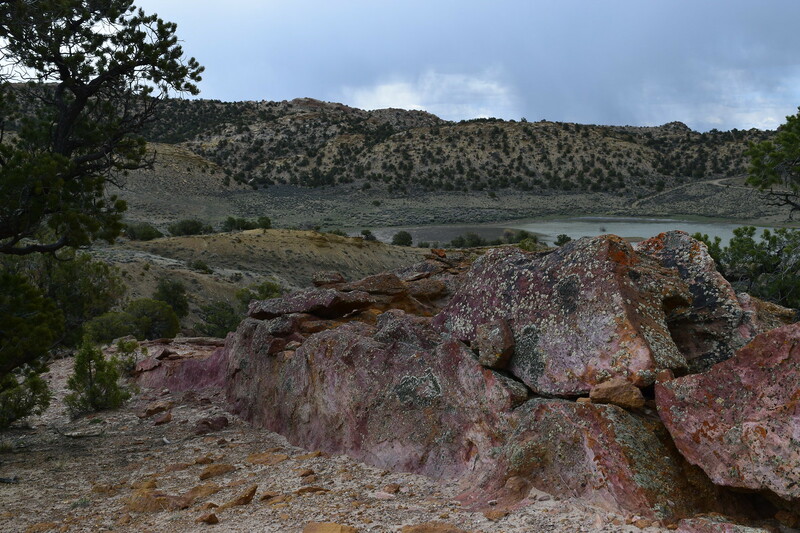 On this day its flow was slow and tranquil, slowly modifying the landscape as geological time creeps by. 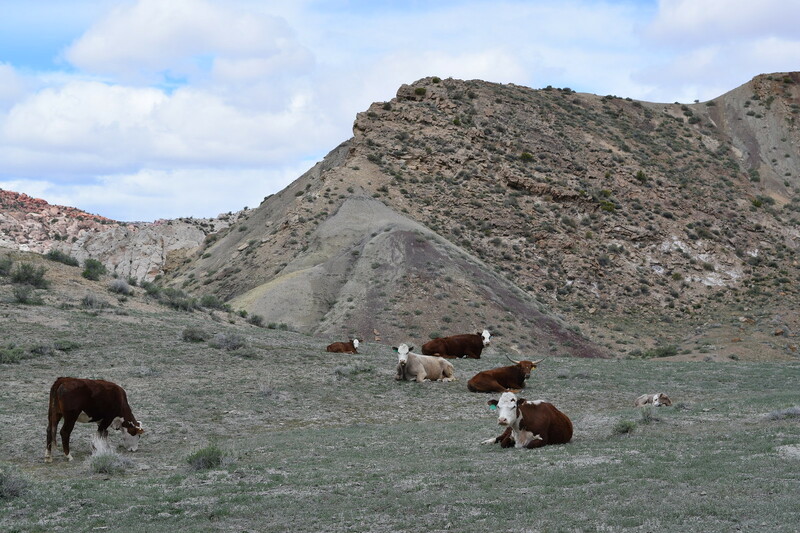 As we came around another corner; Cows! There were plenty more of them roaming about, but I always enjoy running across cows doing what cows are supposed to do. Beautiful scenery continued to impress us with its presence as we continued along the road. 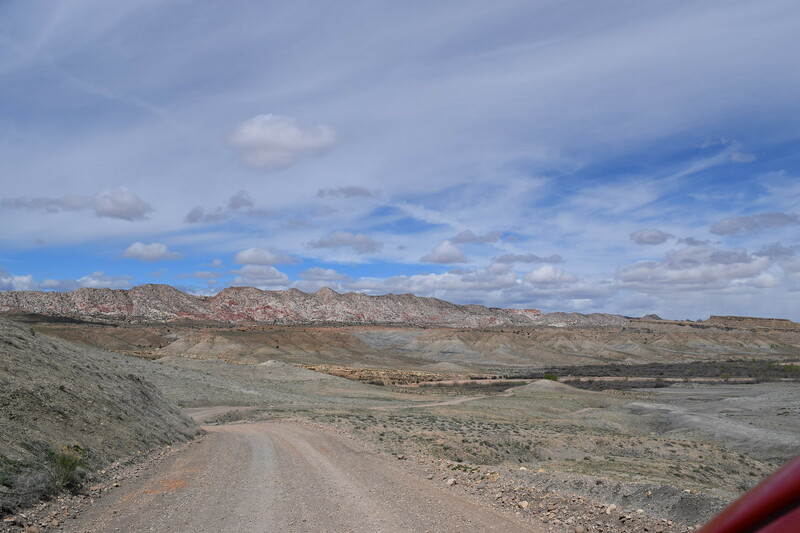 The road was well maintained, and apart from ~2 miles near the beginning that had begun to washboard, we were able to cruise along at a comfortable speed, our destination being the Cottonwood Narrows – South Trailhead, 24 miles from the beginning of the road. 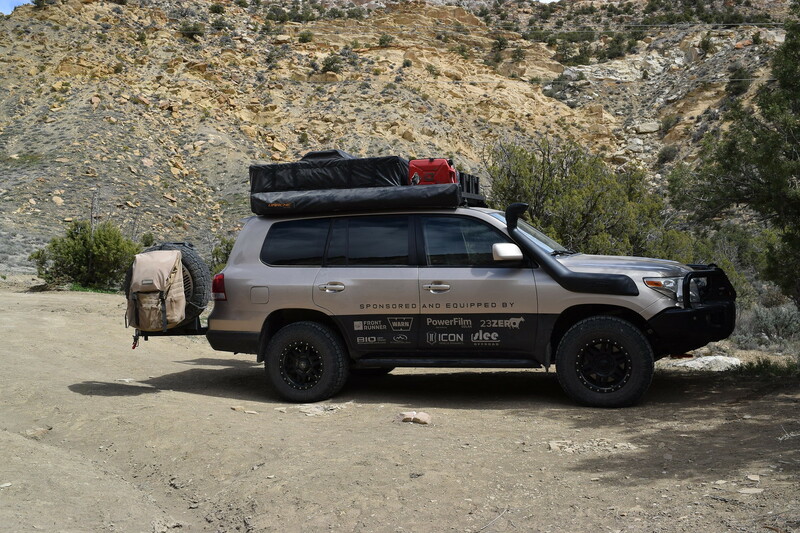 The aired down tires were also lending a helping hand in keeping the ride comfortable and pleasant. 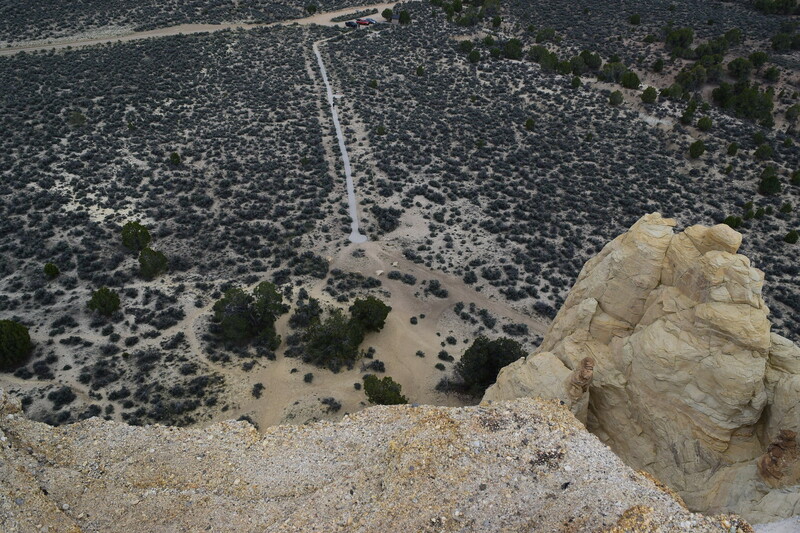 At one point the road winds right next to a massive cliff face. The numerous fallen boulders along the route a reminder that things do come crashing down around here, but I figured we were safe enough for the time being to snap a couple of pictures. We round another bend and once again the views are stunning. It makes it very easy to forget that you are never more than 23 miles from civilization while on this particular road, which neither Tony nor I had an issue with! 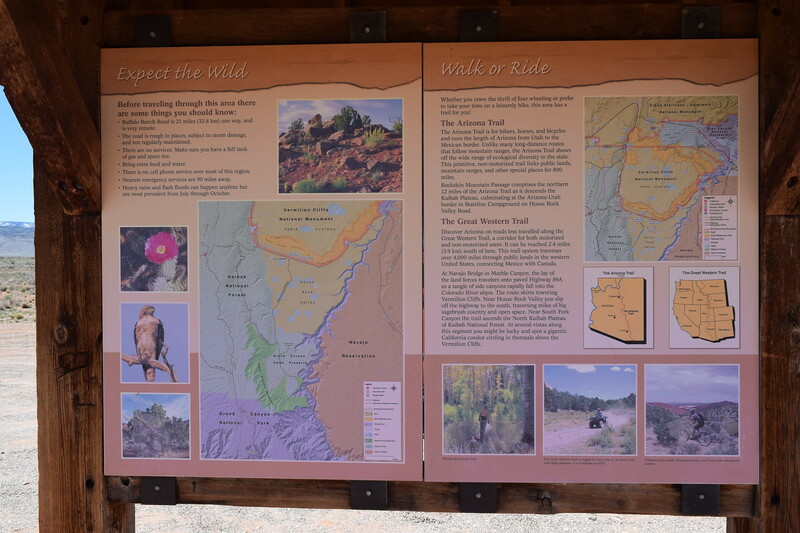 After 45 minutes or so we make it to the trailhead for the Narrows, but alas, the lot was full. So, we push on up the road, looking for a place to pull off to the side and cook up lunch, as it was now after 1 pm and while we had had breakfast before we left the house, we are hungry folk, and delicious food was in order. After 1.8 miles we find a side road. 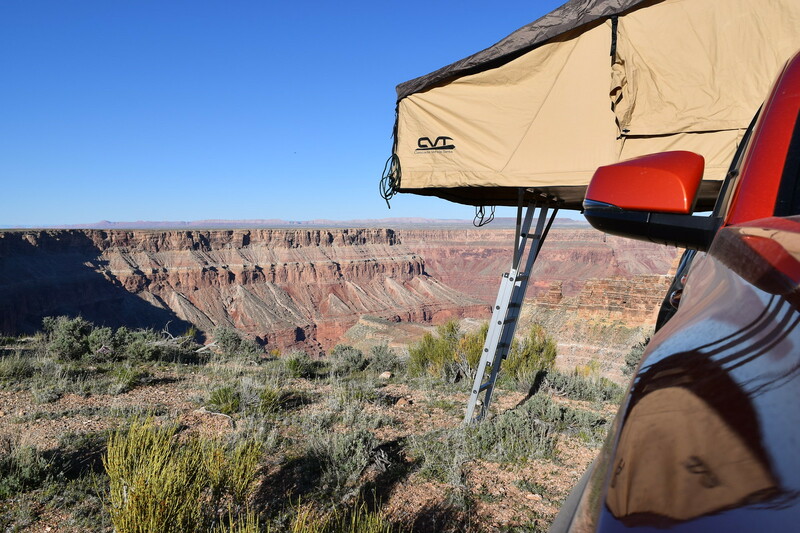 It ends up being a great spot to have lunch, and an even better spot to spend the night, offering a great view, privacy, and the ability to set up my tent right near one of the two fire pits, near the edge of a small cliff. 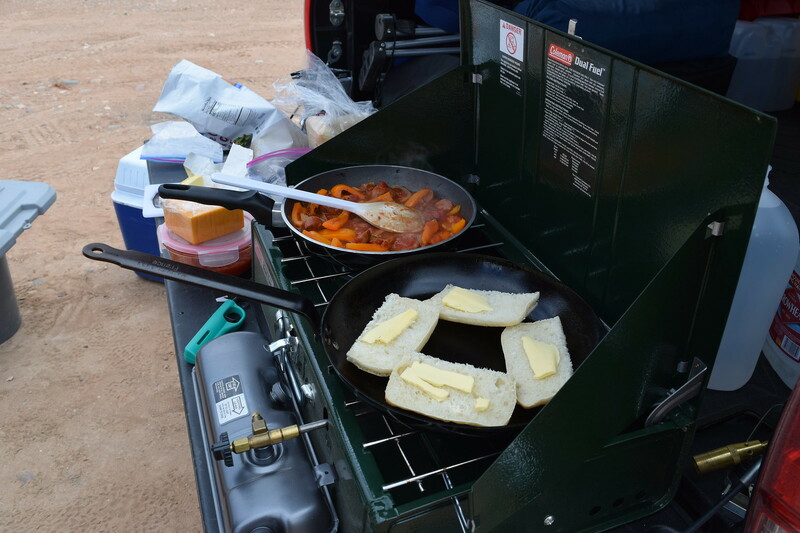 For now, we pull into the center and set up the stove and Tony gets to work making us lunch, which was a delicious combination of Andouille sausage, orange bell peppers, tomato sauce with onions and garlic, on toasted Ciabatta bread from a Flagstaff local bakery. 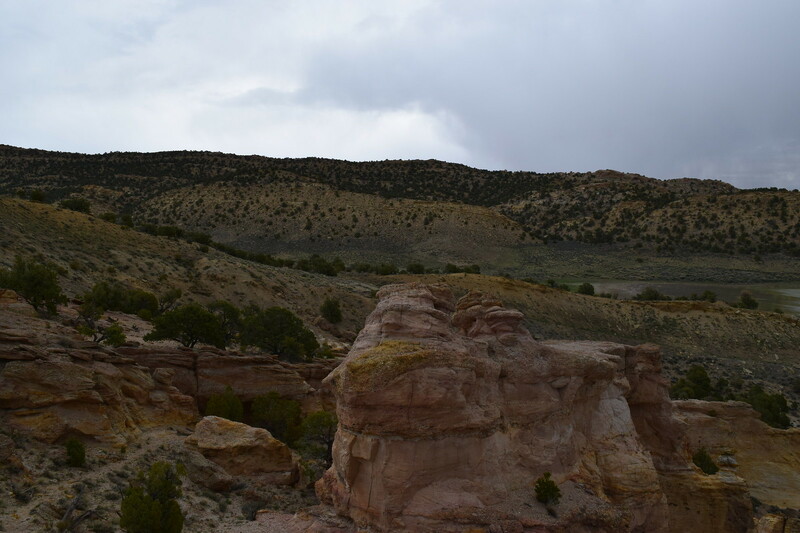 I, meanwhile, explore the surrounding area, snapping pictures as I go. The truck is beginning to get a smidge dirty, always exciting when on a trip like this. While on my way back to lunch I stumble across the markings of some bros, the infamous Four Loko can, left haphazardly on the side of the road. Some people. I pick it up and toss it in our trash bag, as I can’t let things like that go uncorrected. 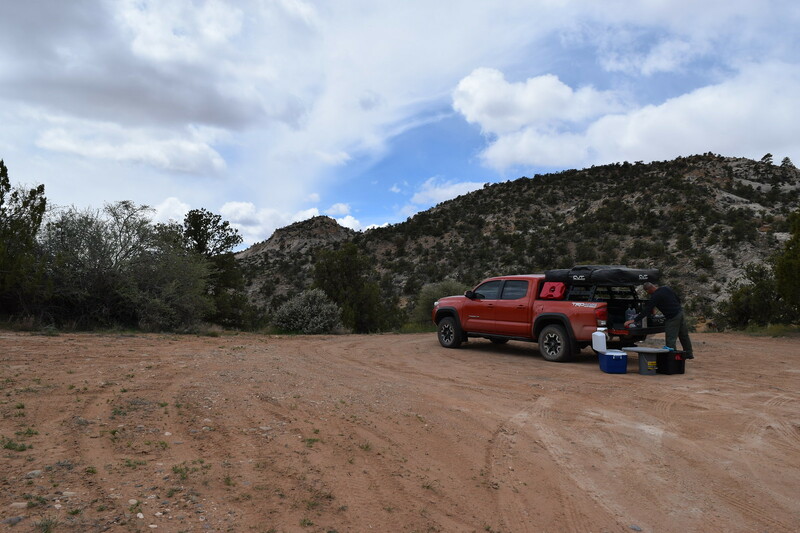 We finish our delicious lunch, unpack Tony’s ground tent and leave two chairs to claim the site, and head back down the road to the trailhead, which has cleared out at this point. Although there was one vehicle left, which definitely out glamped us severely. 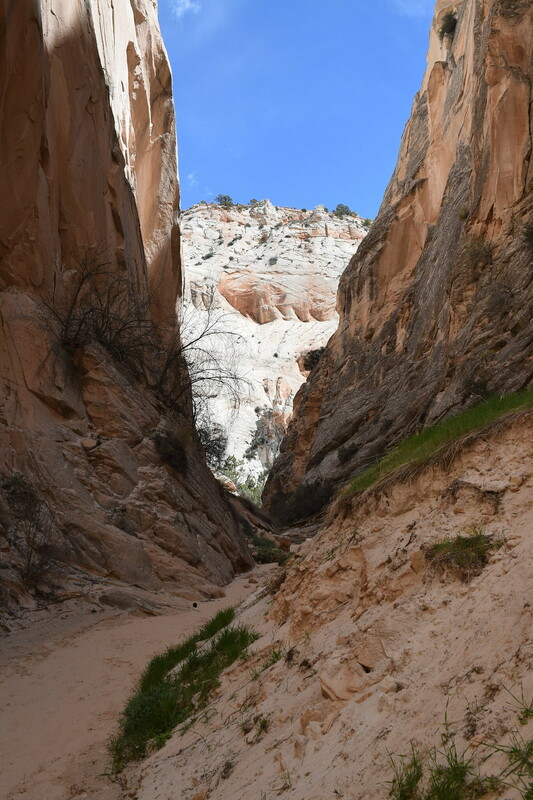 Land Cruiser aside, we set off into the Narrows, following the advice of a guide book based on the Escalante. 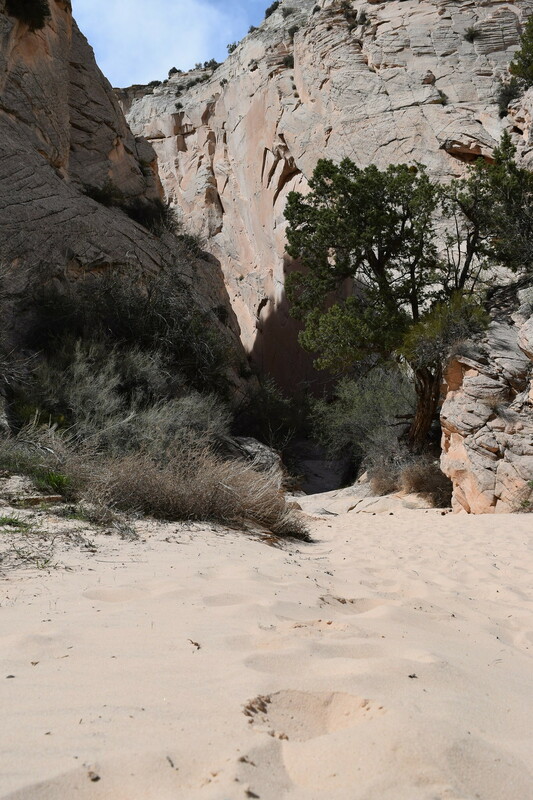 Steep canyon walls and the finest of sands were abundant during our 1.5-mile hike. 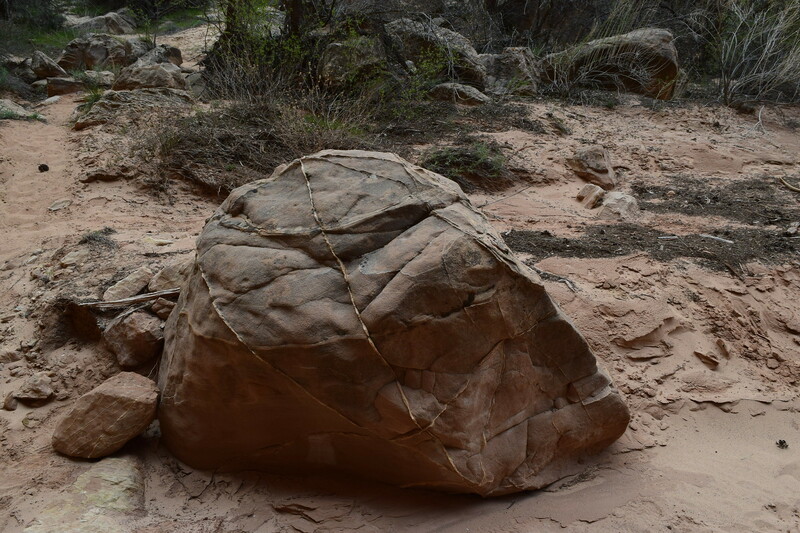 We wish we had had a geologist in our back pockets, as the rock formations were beautiful, and there is always something new to learn about nature. 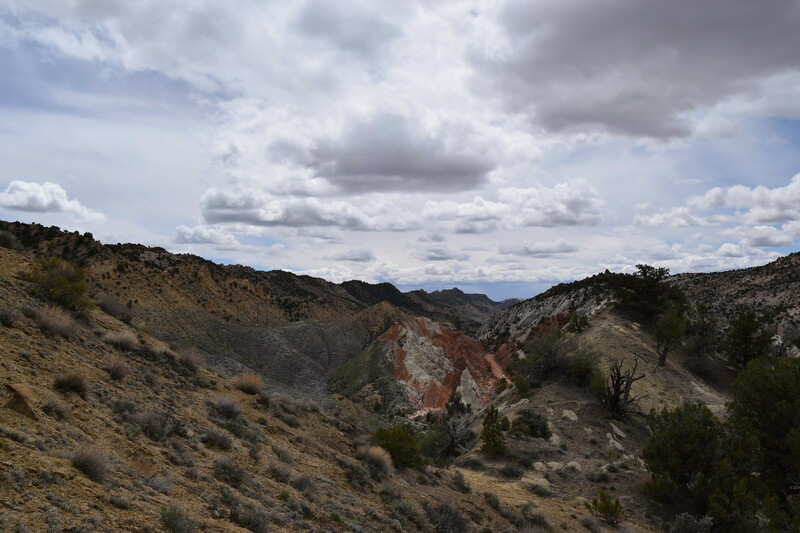 We finished the hike and we were off to our next adventure, roughly ~10 miles up Cottonwood Canyon Road. But first, snow! 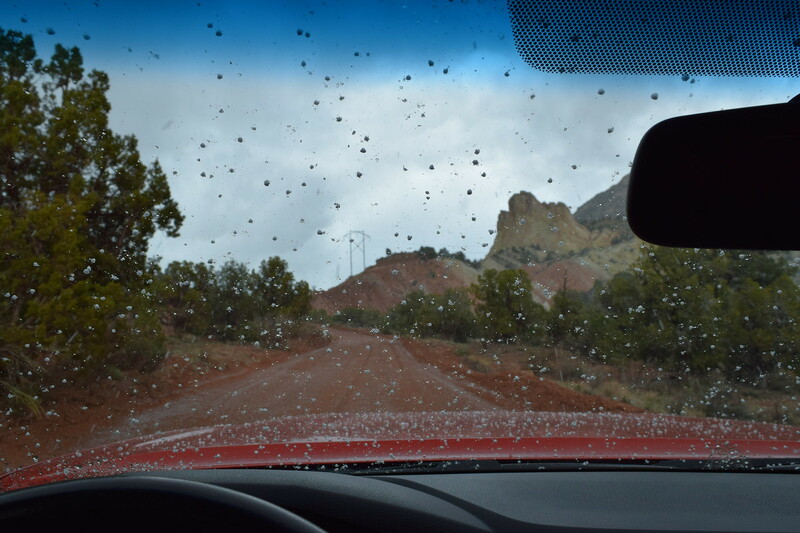 A bit of it started to fall, quickly turning into rain, making us wonder if the easy navigation of the road was about to be a thing of the past. 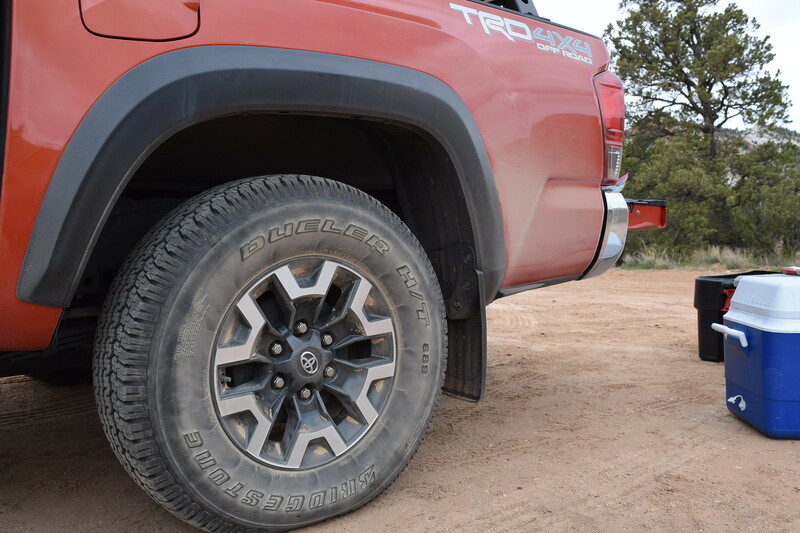 Thankfully, enough precipitation never fell to cause any troubles, though a small bit of mud was slung on to the sliders and wheel wells of the truck. 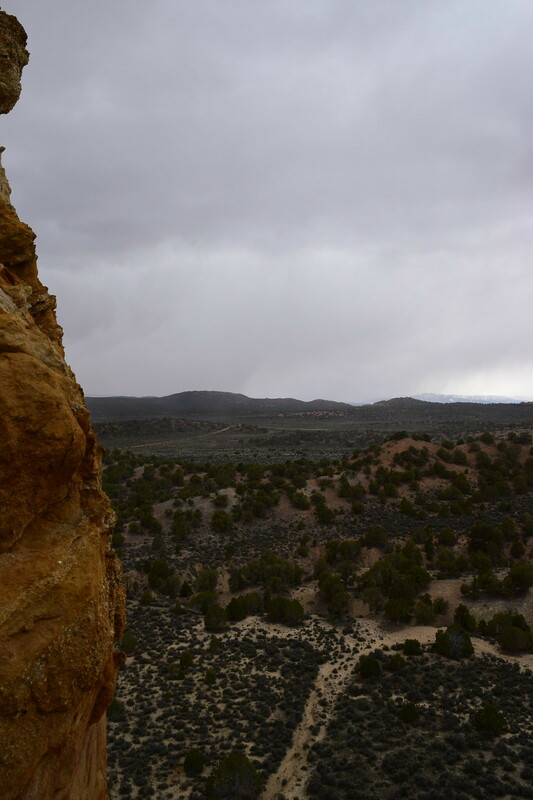 The rain ceased after 10 or so minutes, which was the time it took us to reach our next destination: Grosvenor’s Arch. The arch is actually two arches, one dominating the other in both size and position. A nicely paved sidewalk takes you from the dirt parking lot to the base of the mountain containing the arch. Ever the adventurers, we wanted to know if there was a way to the top of the arch, as the views had to be fantastic from such a vantage point. 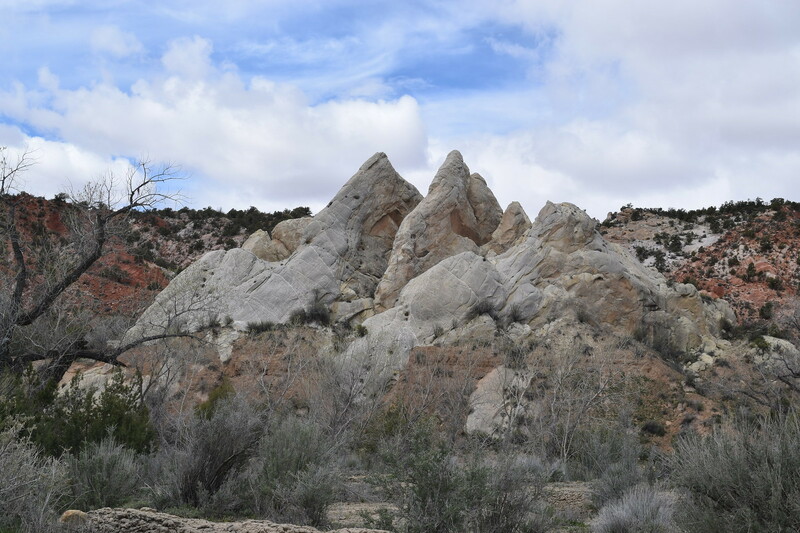 So, we skirted around the side of the mountain on a well-worn foot path, leaving the other visitors at the base to capture only a small portion of what this magnificent formation had to offer. 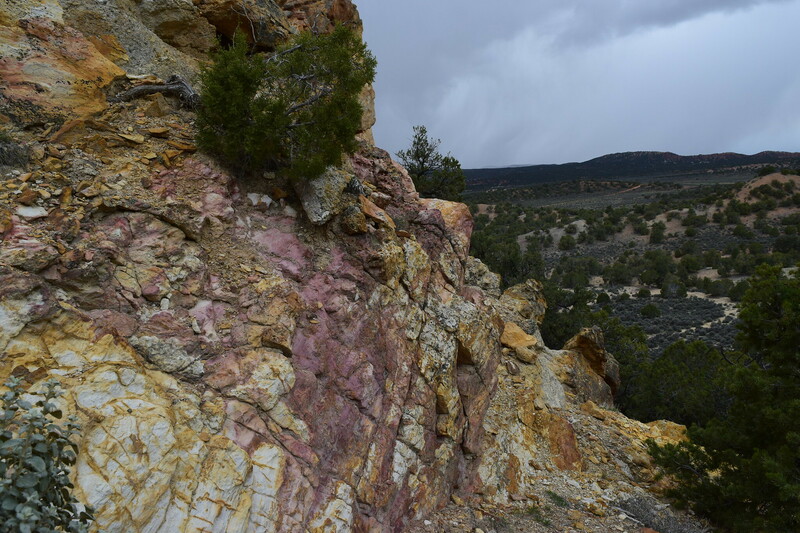 On the way around, more interesting rock formations and colorations caught our attention. The pinks and greens completely invisible from where the sidewalk ends, sharing their beauty only with those courageous (or boneheaded) enough to venture up the backside of the mountain. 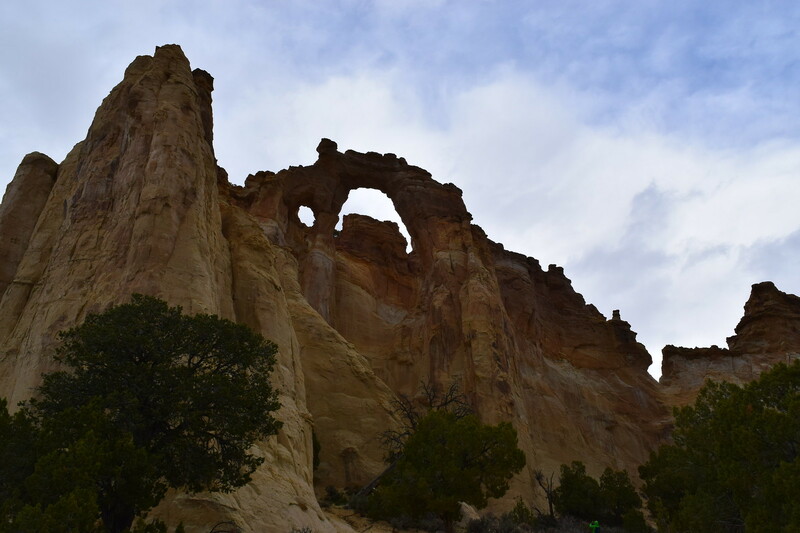 After a simple climb of no more than 10 minutes, we reached the backside of the famed arch. The views, without even reaching the prime vantage point, were already well worth the extra expenditure of energy. 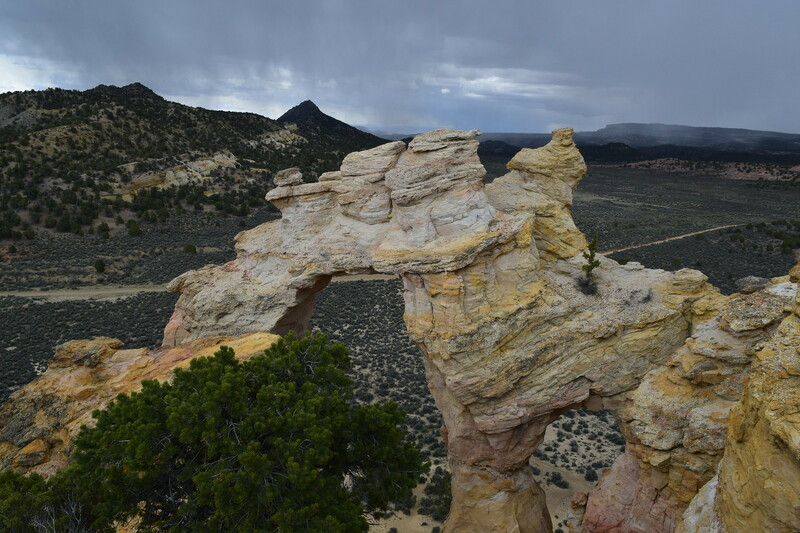 The height of the arch was impressive, offering a great place to sit down, catch your breath, and take in the surroundings. Sitting on top of the arch is a task off of the bucket list, though I would have no issue going back to this particular spot if the opportunity ever presented itself. 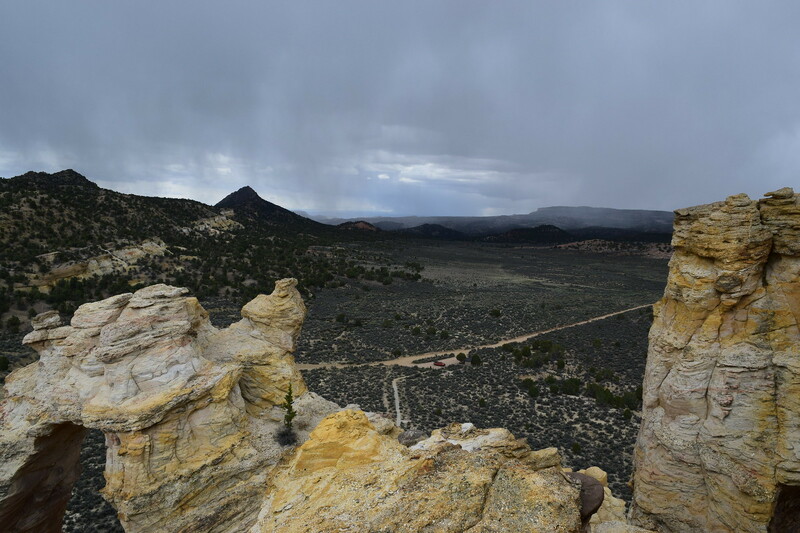 In all directions from atop the arch the natural views left us hypothesizing how this particular series of formations were created by the initial upheaval of tectonic plates and then the erosive powers of wind and rain. 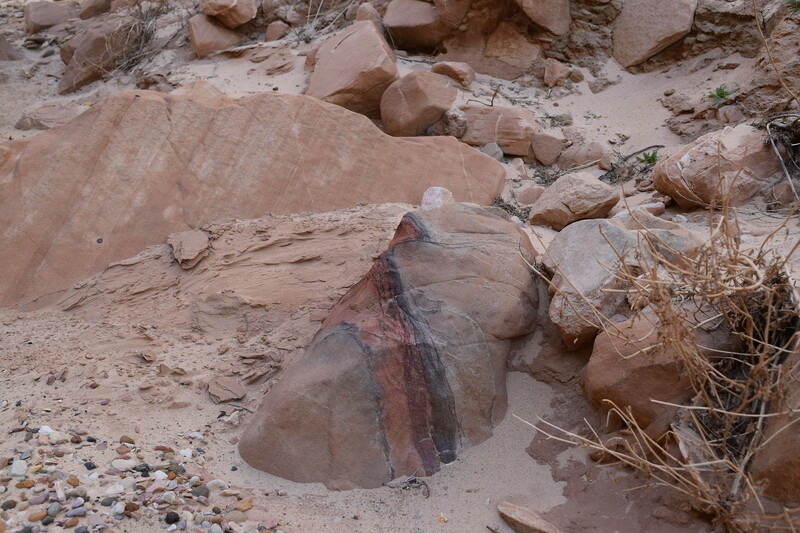 Laughably, neither of us know much about geology, so pure speculation was all that was shared. 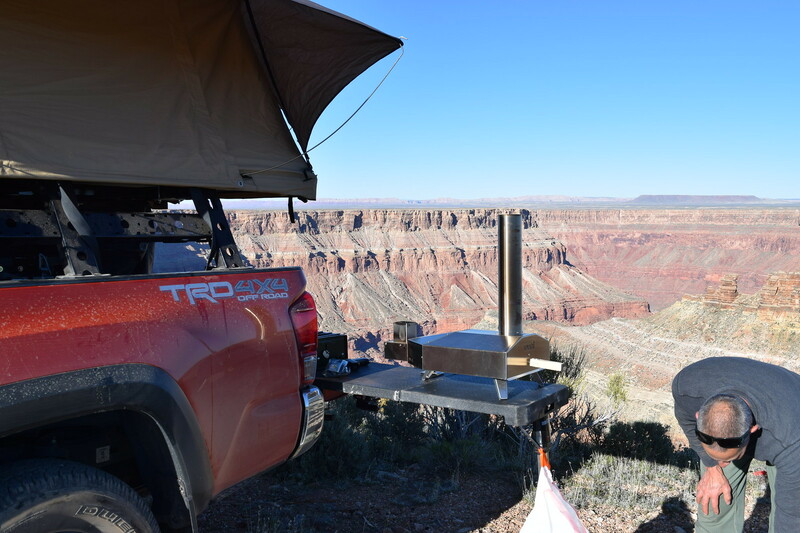 After we soaked in all of the views that we could carry, we said goodbye to this particular spot on Earth and made our way back to camp, dinner ready to be devoured. But first, a shot with the sign that signifies this place. Setting up camp was a breeze, although it did rain on us for ~45 minutes, causing the temperature to drop modestly and the donning of our waterproof rain jackets to be necessary. Dinner was another one for the books. Green Chili grass-fed burgers on Ciabatta bread, paired with spiralized sweet potatoes, kale, bacon, onions, and almonds. Quickly devoured, the topic of the evening turned towards the procurement of fire wood, Juniper as it turns out, and the starting of a fire. My recently acquired Fiskar chopping axe (which I cannot recommend enough) made quick work of several pieces of dead fall. With a large pile of wood to warm us through the evening, we set up our chairs, and got about the business of relaxing and chatting. Tony surprised me with a chocolate chip scone from the same bakery that he purchased the bread, and we warmed it by the fire until the chocolate (a treat to us both) was warm and drippy. 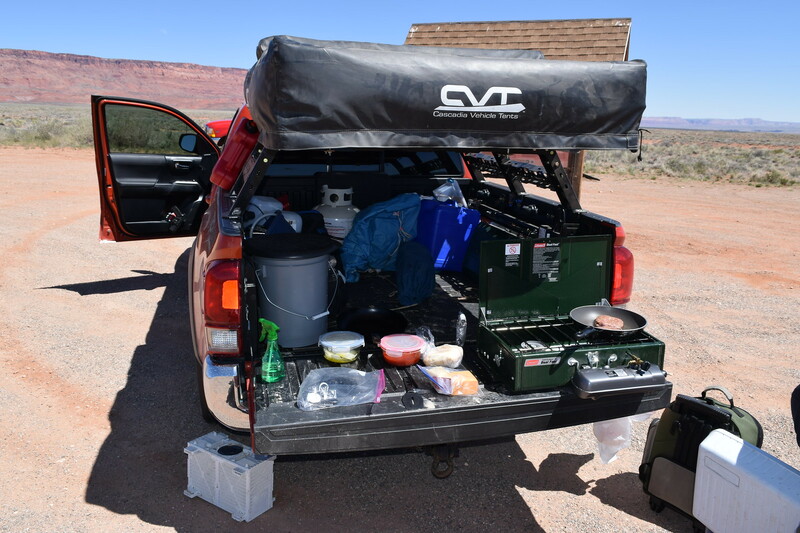 Our bellies completely satisfied, we spent the next couple of hours remarking about the day, talking about the plans for the next day, and discussing what a beautiful place we ended up finding ourselves at. With the fire dying down, and our eyelids getting heavy, we each made our way towards our respective tents, Tony, an avid ground camper, and me, a roof top tent sleeping sonofagun. I read a few pages of ‘Sapiens’ before getting my blankets in order, turning off the light, and drifting off to sleep. Excited as I was for what lay ahead on Day Two, I was quick to fall asleep in the dark, quiet night. I awoke before the sun, partially due to the days driving ahead, with the rest of the motivation to rise coming from a slight chill in the tent. While I packed what I thought was adequate bedding (I don’t sleep in a sleeping bag while in the RTT), it turns out that I could have used one more down comforter to really keep the cold at bay. This is a simple lesson learned, as it is much easier to kick off an extra layer than attempt to keep yourself comfortable with too little bedding. I won’t be making this particular mistake again. 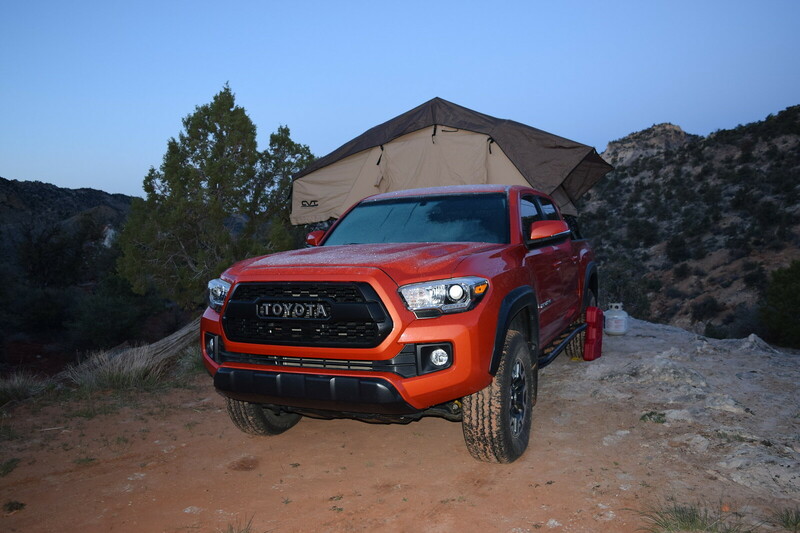 I clamored out of the tent to find a nice coating of frost on the rain fly and the Tacoma. I fired up the stove and got a pot of water boiling for our early morning tea. 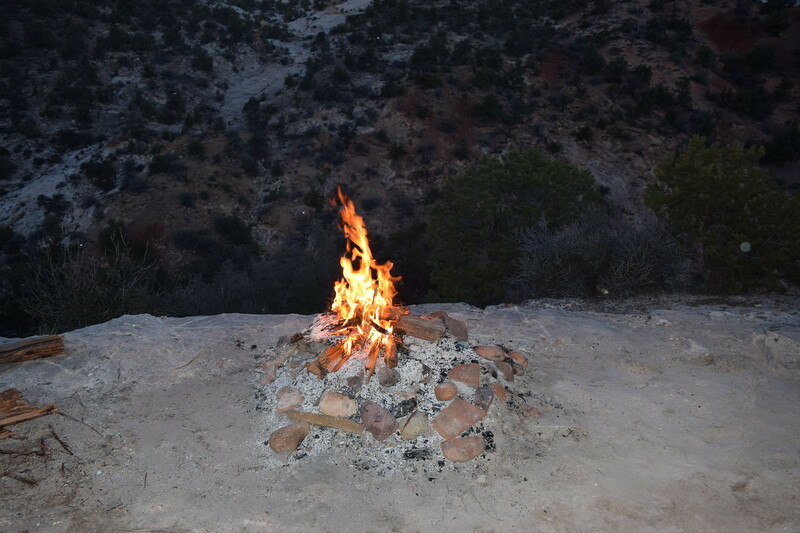 Then I added kindling and firewood to the fire pit, grabbed the torch, and relit the camp fire, as the chill on this particular morning was gripping. Tony was quick to join me, and breakfast was prepared without wasting any time. Breakfast consisted of bacon, stringed sweet potatoes, fried eggs, and a butter coffee. Exquisitely delicious, we began packing up camp, planning to hit the road towards our second destination, Hurricane, UT, as quickly as we could. Today would involve a lot of driving and we wanted to reach our second campsite with enough time to enjoy its company. So, at 8:10 AM we set off back down Cottonwood Canyon Road towards the 89 Freeway, ~28 miles of dirt road to cover. On the way out we stopped for a few minutes to take in a particularly joyous scene, beautiful rock outcroppings of a variety of colors being painted by the sun. 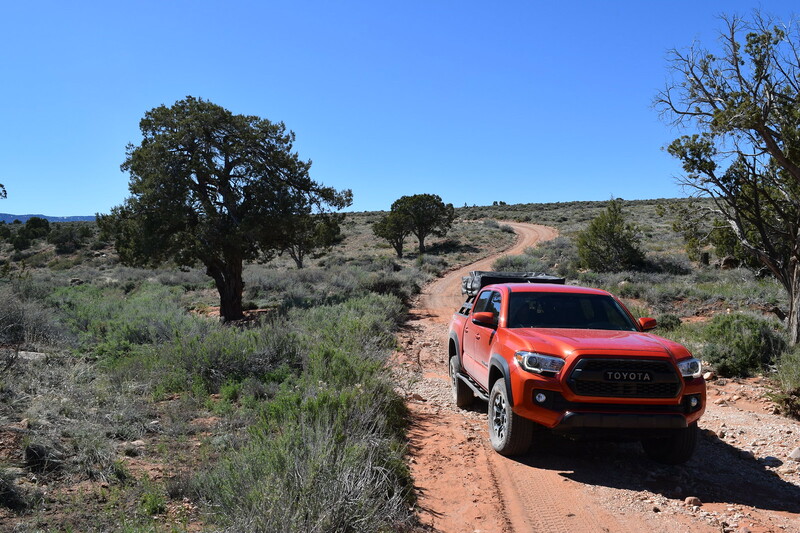 We were the only ones on the road at this early hour and made excellent time on the well-maintained dirt road. 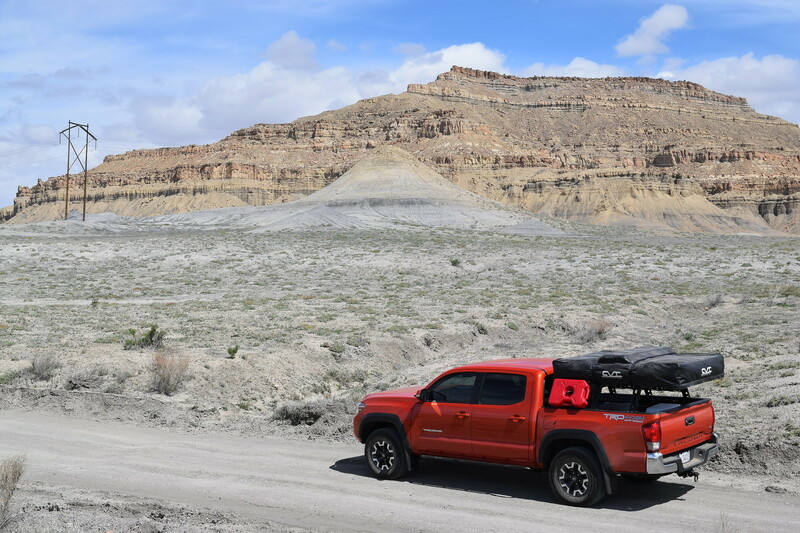 Even with the desire to get on the road, the surrounding landscape was too irresistible, and exploratory stops were conducted along the way. 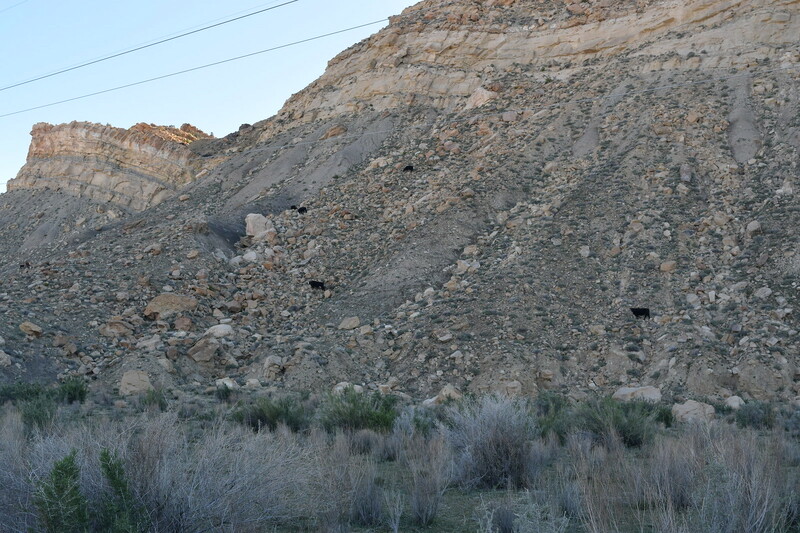 We were even surprised to see a small group of cows behaving like mountain goats, foraging for food up a steep mountain side. I never knew cows behaved in such a manner! As we neared the exit, one final stop was necessary in this magnificent spot. The views were simply too mesmerizing to attempt to merely memorize them. Copious amounts of pictures were in order. Before we knew it, the 89 reared its paved head in front of us. A quick stop at the road’s entry sign was required, in order to inflate the tires back to street pressure. When I say quick, I mean QUICK! The recently acquired and filled 20 lb Co2 Power Tank was able to bring my stock tires from 20 to 31 psi in 16 seconds each. The 30 ft coiled hose made 1 man filling an absolute breeze. Crank open the main valve, set the secondary valve to 225 psi, snap the hose on via a quick connect and you are off. 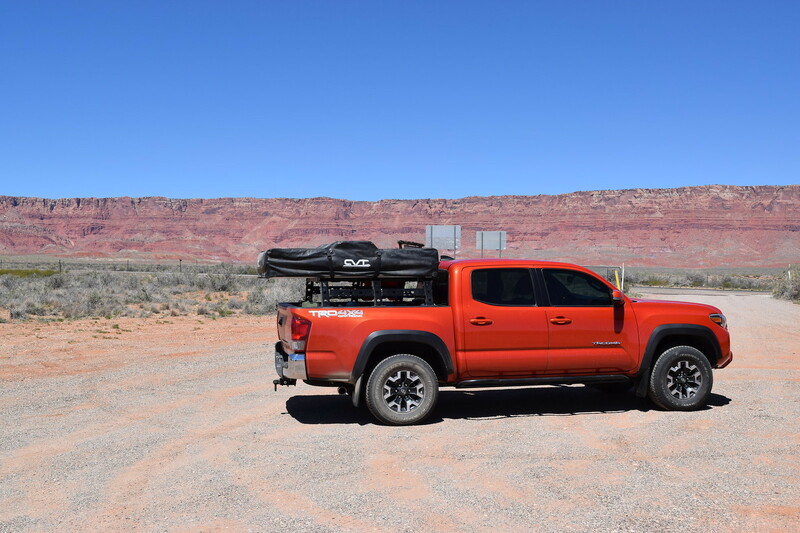 Slightly more expensive (or maybe equal depending on mounting choice) than a dual ARB setup, with the additional slight hassle of filling the tank at a local dive shop, its performance is unquestionably unbeatable. Very, very satisfied. With that taken care of, we set off. 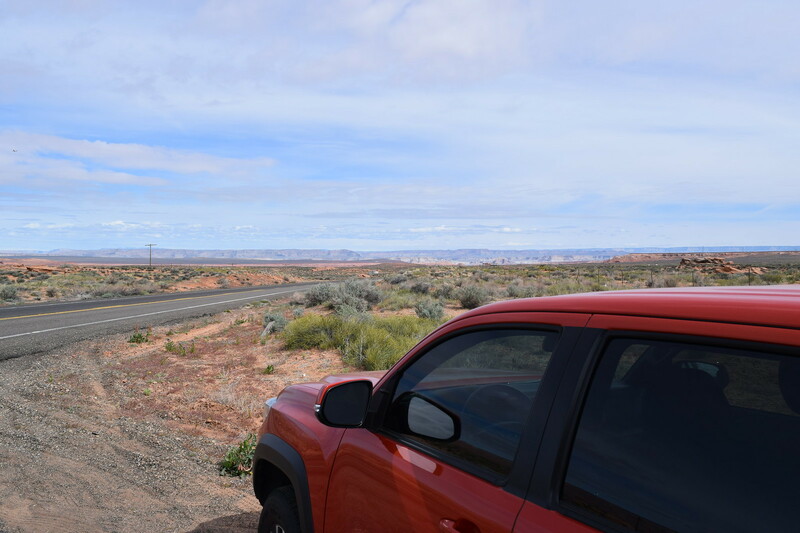 Plenty of highway miles to cover, Lonesome Dove making another appearance to fill the silence, we set off towards Kanab, UT. 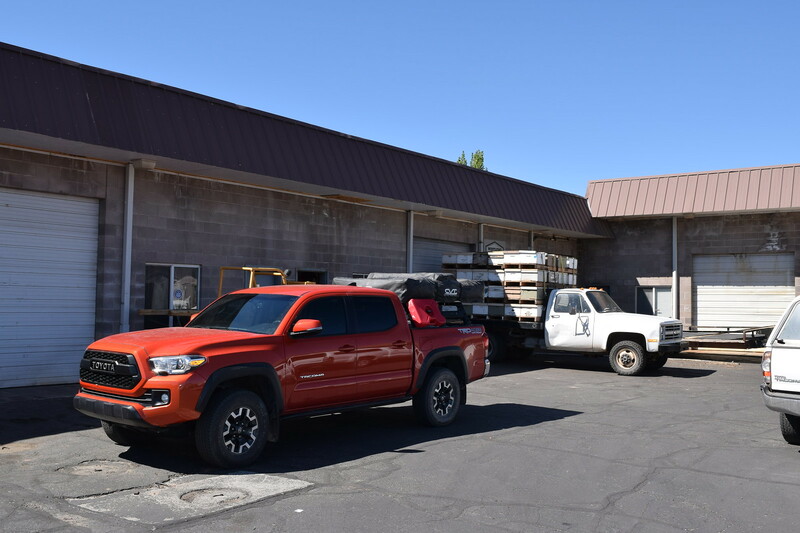 After Kanab we make a quick jaunt down into Fredonia, AZ before heading up to Colorado City, AZ, and then finally into Hurricane. In Hurricane we reach our destination. An old storage shed facility. 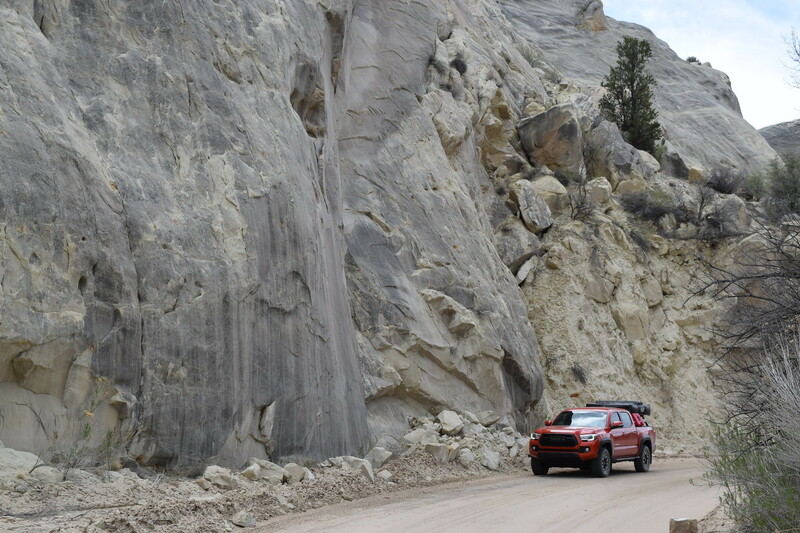 The place that is the driving factor for this particular adventure. Tony goes inside to talk to a man named Corey. 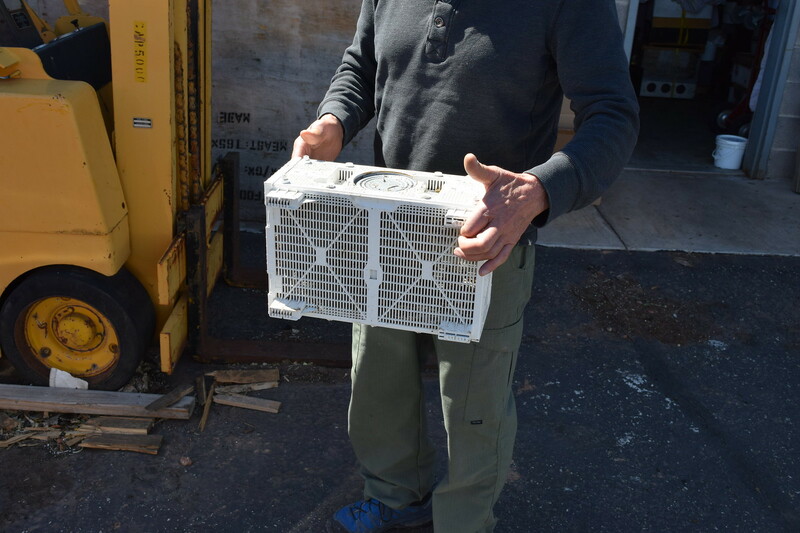 A few minutes later, after being educated on effective transport and care, he emerges with his prized possession. A crate with 1 queen bee and 3,000 of her crew members. They’re off with us to a new life in a top bar beehive in our backyard. 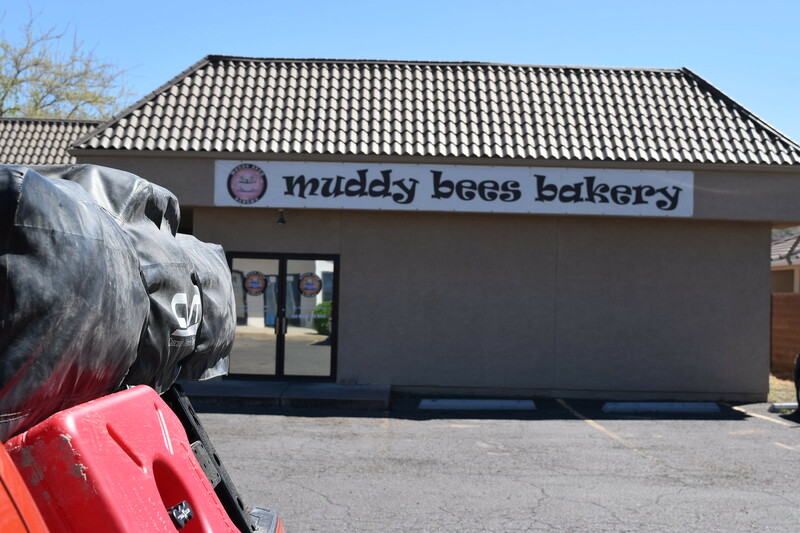 Package in tow, we drive through the small town to the bakery that partners with the bee farm, Muddy Bees Bakery. We head inside and purchase honey made with ghee, along with a couple of other delicious treats for our journey south towards the North Rim of the Grand Canyon. With plenty of fuel to make the drive ahead, we set our sights south, going back down the same road we just drove in on. 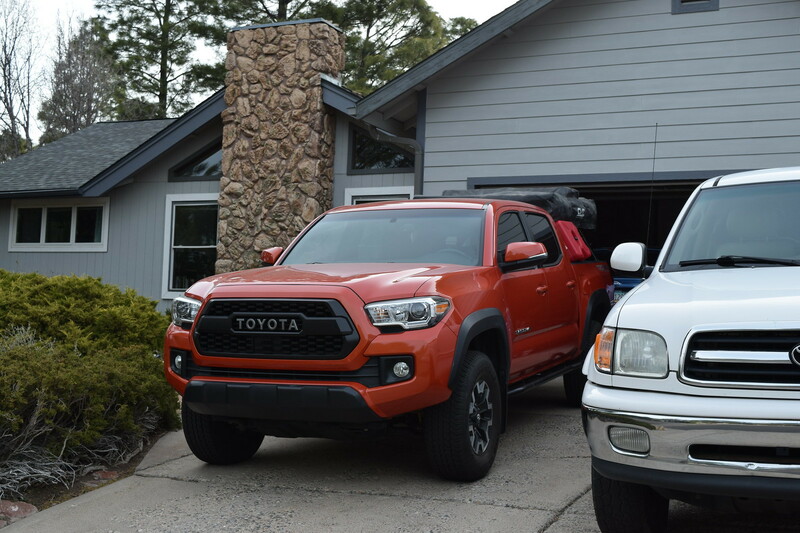 We make great time through Colorado City, Fredonia, and then up and down the hill towards Jacobs Lake Lodge. 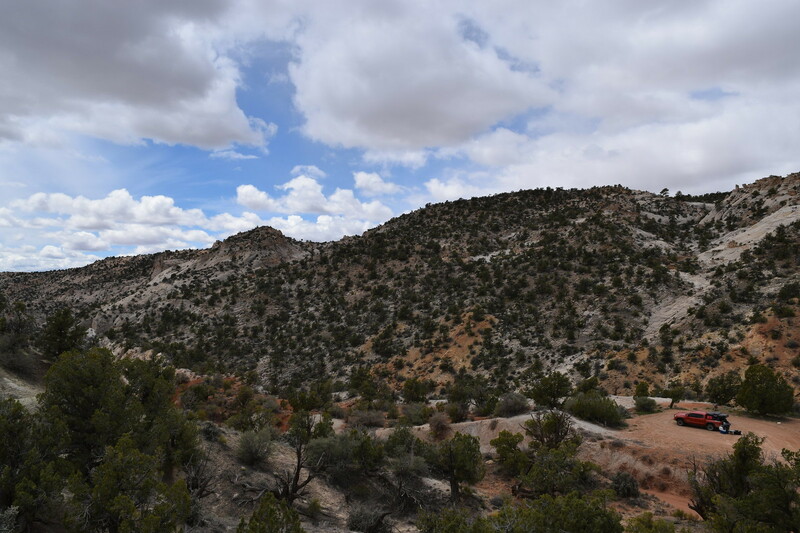 We make it to the 89A at Jacobs Lake Lodge and head East towards Buffalo Ranch Road, an offshoot of the 89A that provides access to hundreds of square miles of desert landscape, with a distinct mountain range in the distant background. 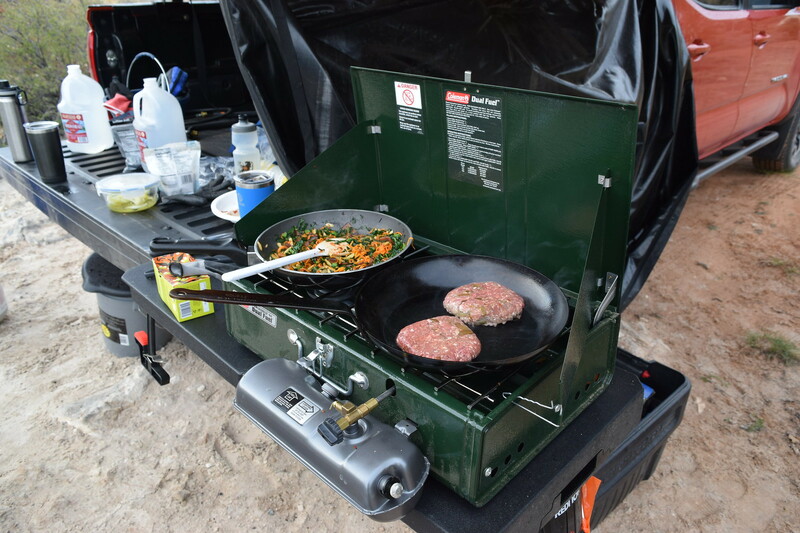 At the entrance to Buffalo Ranch Road we stop to air down to 20 psi and to cook lunch. The landscape, although different, is still captivating to the eye, and a moments pause is given to the natural landscape. While Tony is preparing lunch I take a peek around the truck, ensuring everything is still where it should be after the morning (and early afternoon) of driving. 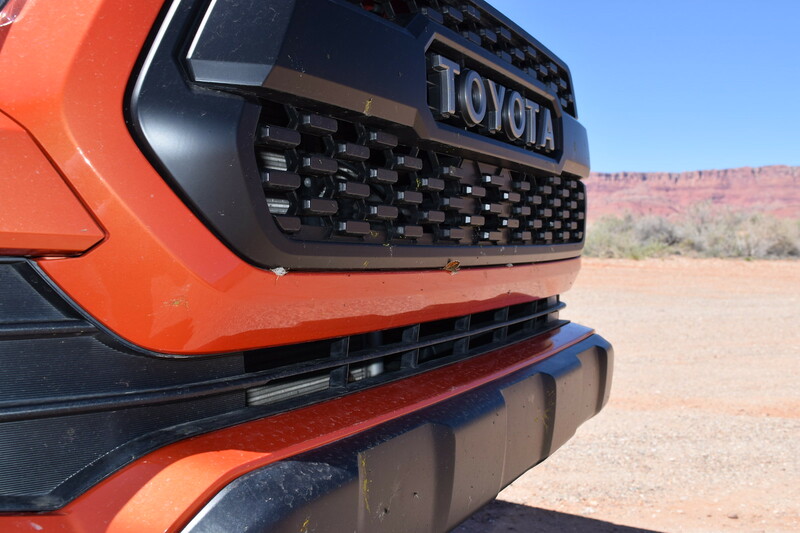 All is well with the truck, although unfortunately a few butterflies were killed in the making of our adventure. Lunch is a quick one, green chili burgers on the last remaining piece of Ciabatta bread. We pull the bees out from behind the passenger seat, spray them with water, and place them in the shade of the truck while we eat. You can determine how agitated, and therefore how hot, the bees are by the intensity of the buzzing that they are making. Things are still relatively quiet with our group, but a little extra precaution is never a bad thing when dealing with living things. 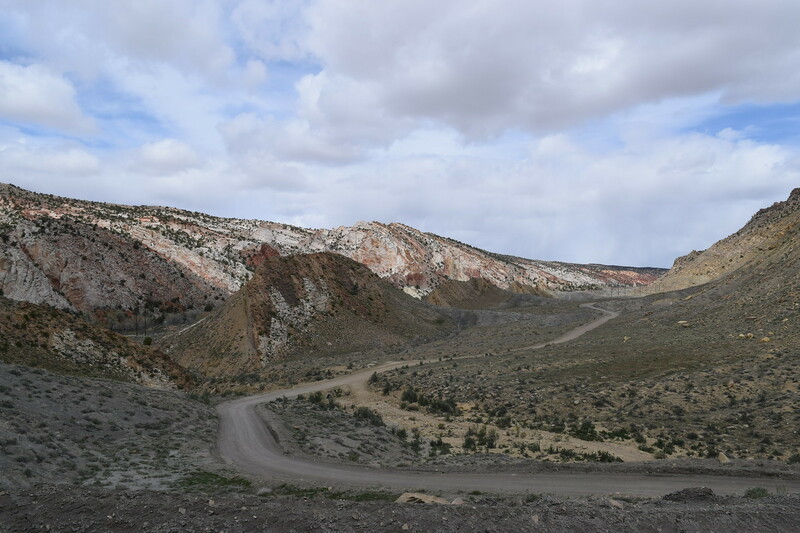 Our hunger temporarily satisfied, we set off down the dirt road, with a destination that is ~30 miles from the entrance. 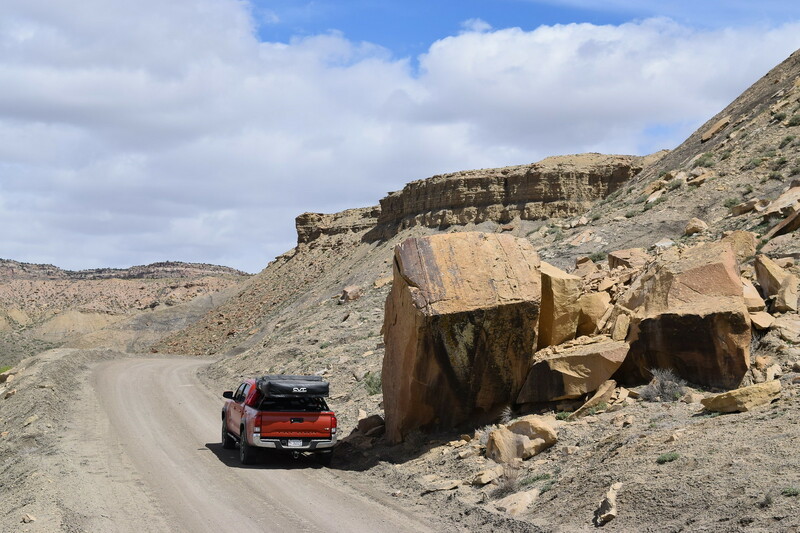 This road, while not as maintained as Cottonwood Canyon Road, is still relatively easy to travel. Frequent drainage channels across the road decrease the average traveled speed. None offer any challenge, with the ‘toughest’ crossing causing the truck to flex its stuff. 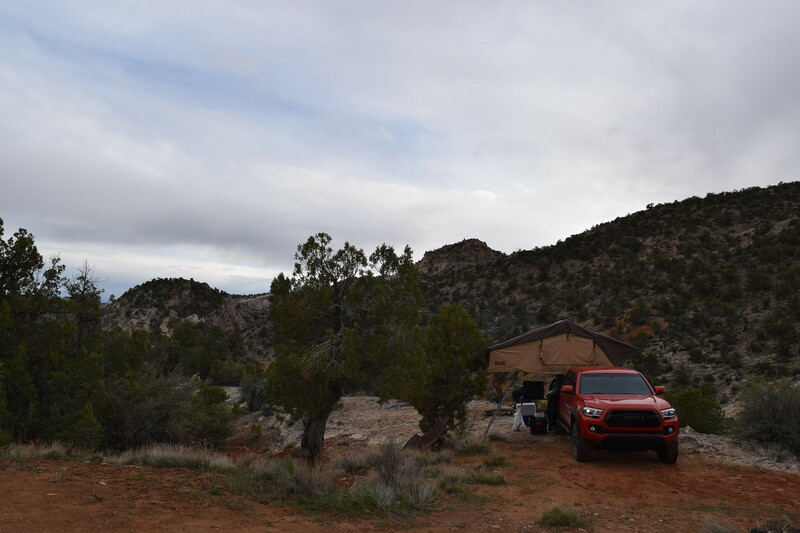 After ~70 minutes on the dirt road, and 9 hours of driving for the day, we find our small offshoot, labeled 445R, which provides access to our campsite for the night. And what a campsite it turned out to be! Now, I knew we were in for a treat, but I was unaware just how tasty the treat would be! 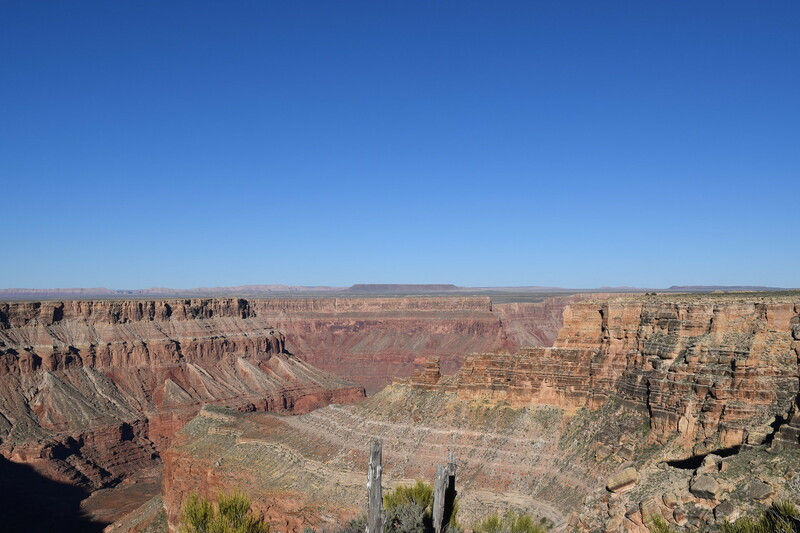 We had finally made it to my favorite place on Earth, the North Rim of the Grand Canyon. Without exception, there is no better place in the world to experience what life is about, than this one in particular. Pictures (and my amateur photography skills and equipment) do not do this place justice. We unload the truck and make a ~1.5 mile jaunt down the road to procure firewood for the evening, as our current spot is void of adequate firewood. 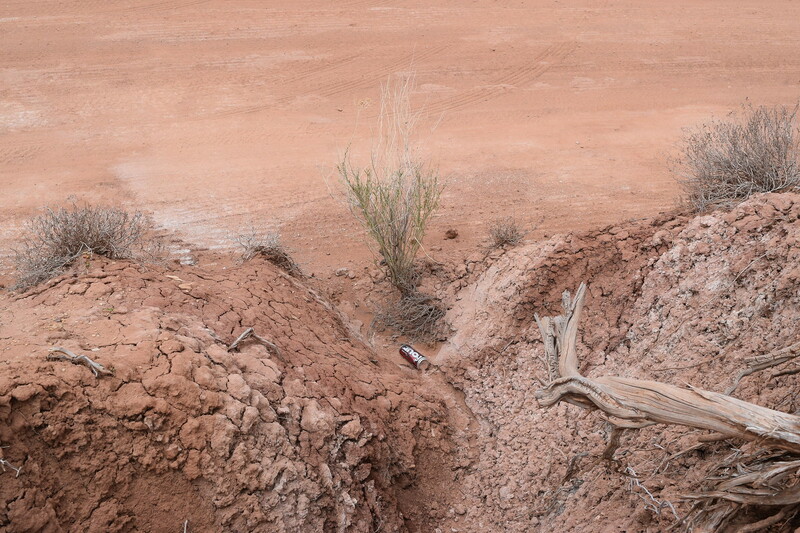 Wood acquired and deposited near the firepit, we back the truck towards the edge of the canyon (15 feet from the edge!) and set up camp, giddy as school children about to be released on summer break. This is another moment, though certainly not the last if I have anything to say about it, that is off of the bucket list. The weather was ideal, the views unparalleled, and the self-reflection immense. For whenever I get to the GC, the quality and clarity of my thoughts is increased. The hustle and bustle associated with the running of businesses, the acquisition of as much relevant knowledge as possible to better perform as an engineer, the daily chores that maintain a clean and healthy home, and the grind of most aspects of daily life simply vanish, like smoke. A closeness with oneself, and with the area around you, creates a feeling of inner peace, much needed in our current society. 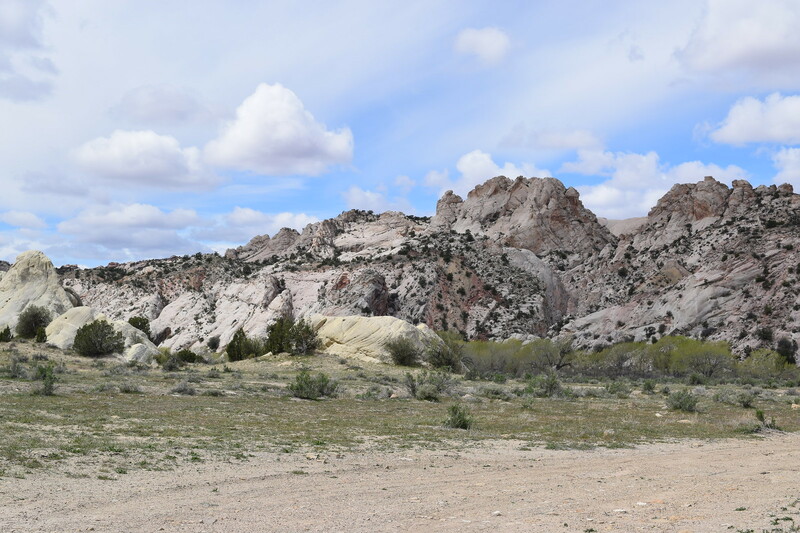 With adequate time before dinner, we explore the area surrounding camp, traveling to an exposed outcropping of rock to better take in the sights. When that is as complete as it could be, I set up my chair right near the edge and simply sit there quietly. 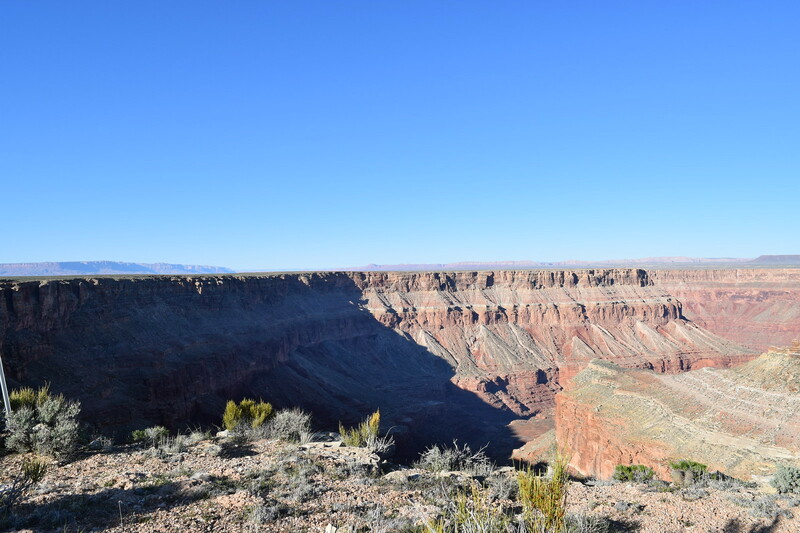 As strange as it sounds in our current society, though certainly the norm throughout most of Sapiens time on Earth, I begin to feel rather animistic towards the canyon itself, as if it has a story it wishes to share with me. A grand story told on the immense time scale necessary to create such a masterpiece. All is well. A tremendous feeling of good fortune flows through me, as I know opportunities to do what I am doing are affordable to only a small few. Content with the moment, and for many more moments to come, the sun starts to get lower in the sky, and dinner is to be prepared. At a time, and location like this, only one dinner option comes close to being sufficient. Another task off of the bucket list. 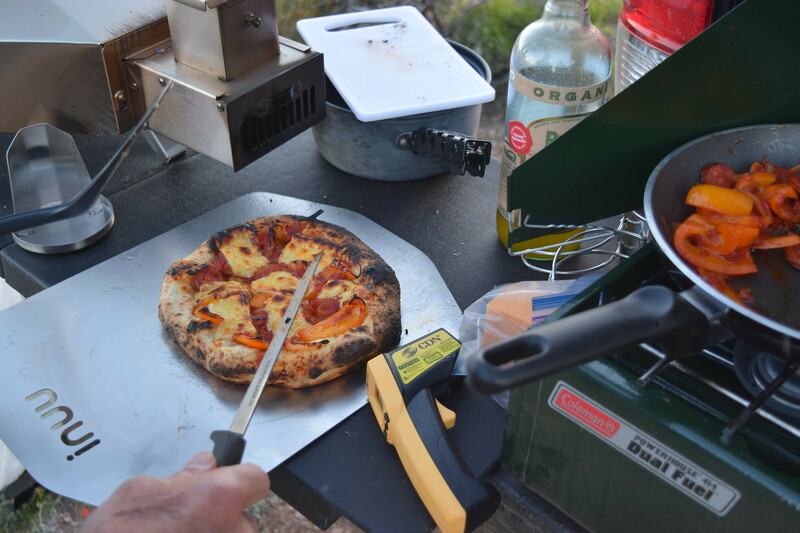 Wood fired, handmade pizzas. A delicacy that Tony and I enjoy a few times each year. While we thoroughly enjoy our edible creations, we take in the even more glorious sights that are unfolding before our eyes, for as the sun goes down behind us, the landscape in front of us constantly changes. 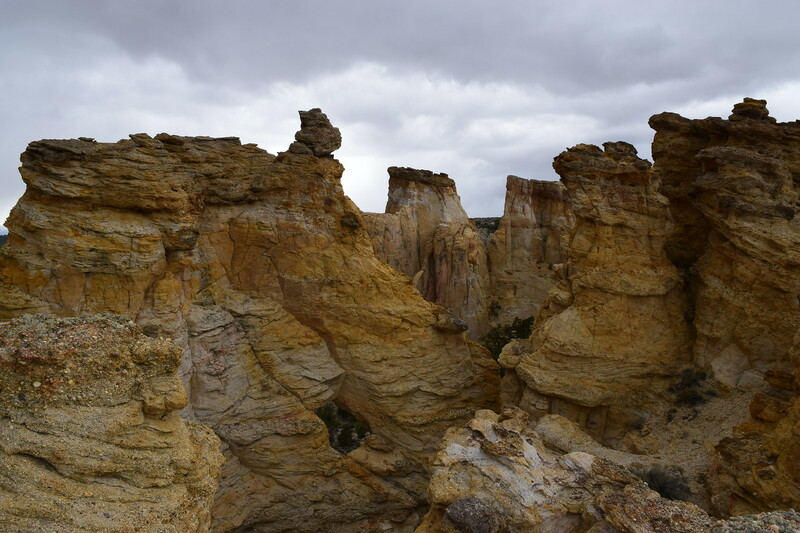 New rock formations and colors are exposed as light transitions to darkness, highlighting previously invisible portions of the canyon. Words are not sufficient to communicate the feeling of satisfaction at this particular moment in time. So, I won’t even bother, as I would most assuredly fail horribly. The sun is quick to set, and a fire is started to combat the cold. Then; wind. Serious wind. 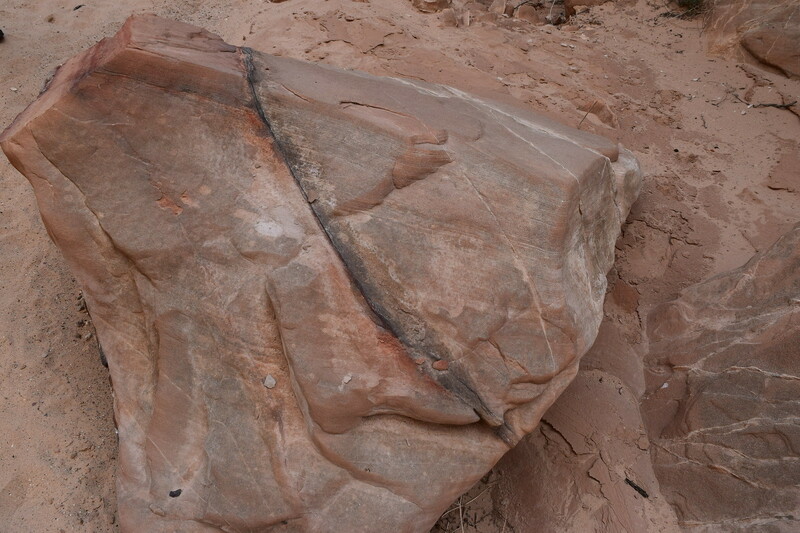 The setting sun, and the subsequent change in temperature, causes severe winds to blow across the flat, exposed portion of land that we are occupying. The tent is whipped about, the heat is stolen from our bodies, and the fire is blown sideways. A surprise to be sure, but the mood for the evening is as high as it has ever been, so a bit of wind doesn’t even slow us down. We keep the fire low and turn our backs to the wind, enjoying tea and conversation. 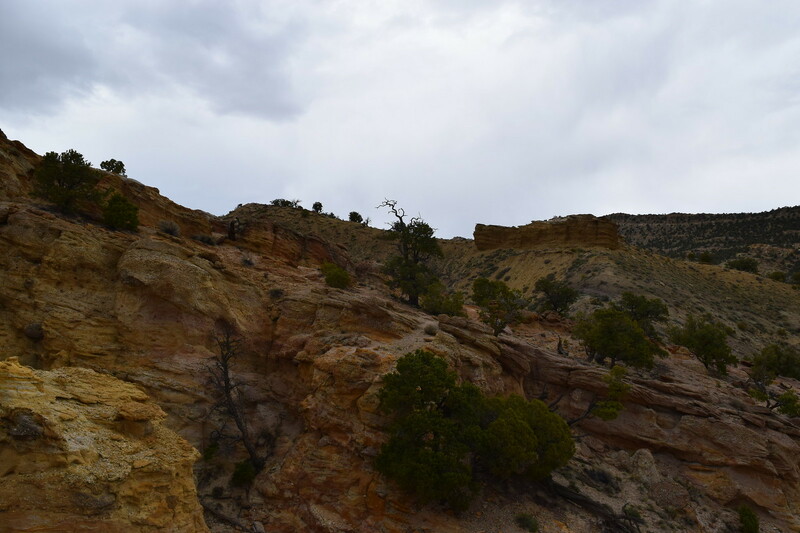 All light quickly fades away, though the moon is bright, offering another distinctly different view of the canyon. Bees safely tucked away inside the truck, huddled together around the queen in one slowly revolving clump, we each retire to our respective tents. No reading on this night, and I quickly find my way to sleep despite the ferocious wind pulling and grabbing at the tent. This is a day that I will never forget.